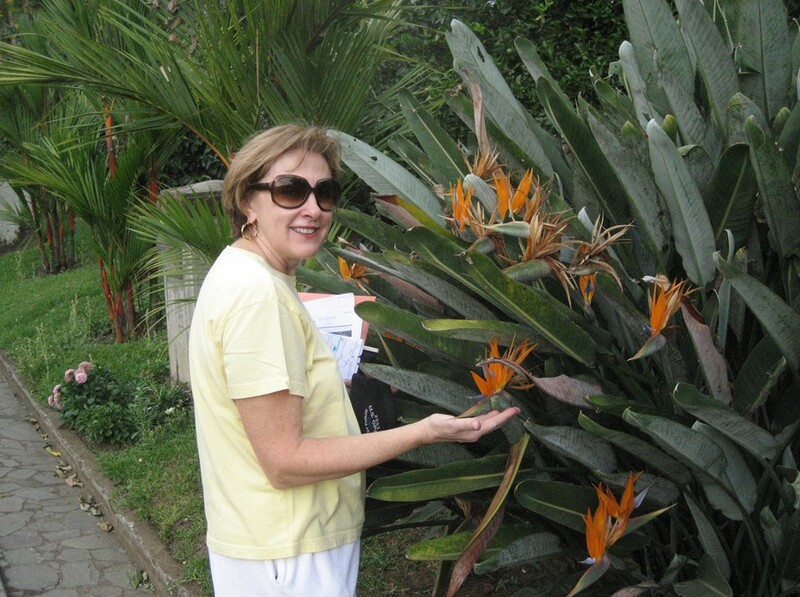 Patricia planned the whole trip and it was not easy. Nine days in a country that neither of us had ever before visited. It took a lot of time on the internet and several international phone calls to get most of the trip lined up. Intentionally, the third night had no hotel reservation. The plan was to get to San Jose, take one all-day tour to get acclimated, then rent a car and see if we could find our way around. We left Chicago on a 6 AM flight Saturday morning January 19, 2008 with a stopover in Dallas on our way to San Jose, Costa Rica. It was 3º F in Chicago that morning so we picked a perfect time to leave. Both the flight to Dallas and the flight to San Jose departed on time and were uneventful. We were actually fed a light lunch on the San Jose leg. We arrived in San Jose at about 2:30 PM (CST) and cleared immigration and customs without event. There was a brief, 10-minute taxi ride to the Marriott and our winter adventure was underway. 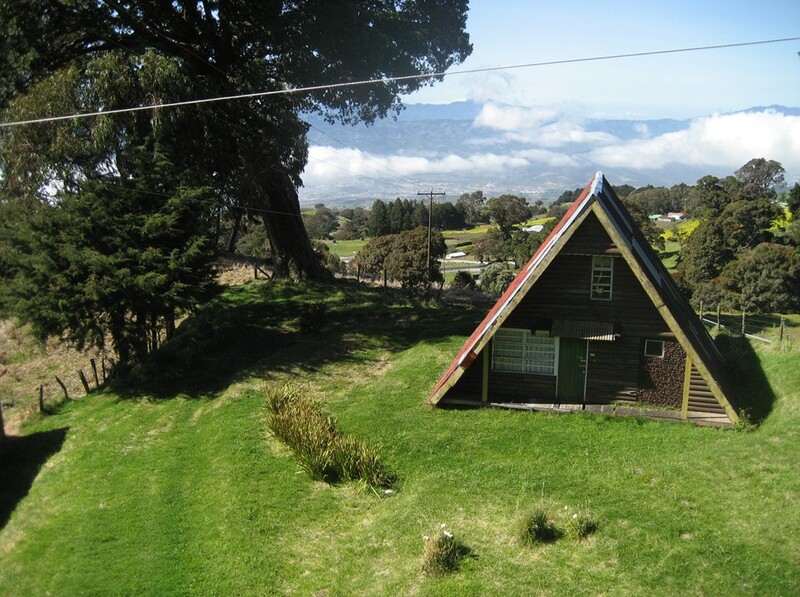 The hotel is land-locked but in a very attractive setting close to the airport. Visitors are welcomed at the entrance by a fairly casual security detail. 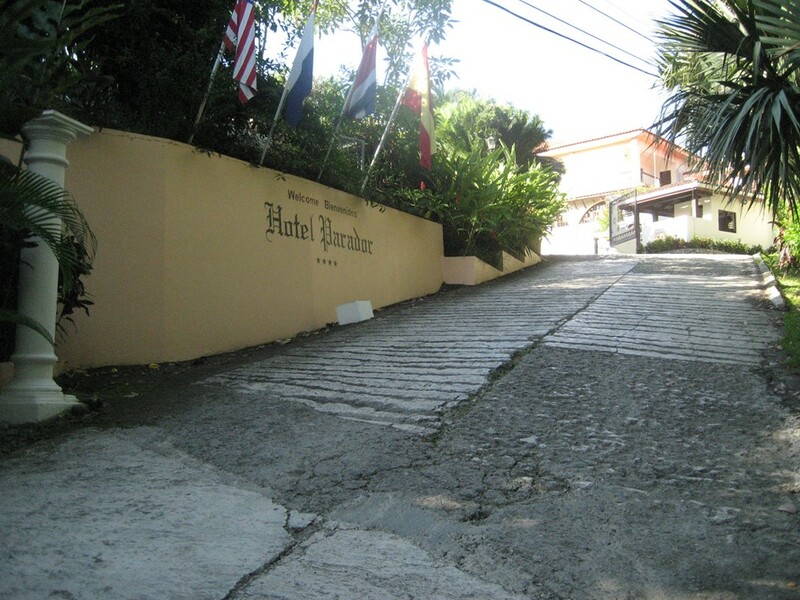 A short driveway takes you to the hotel entrance. There were some very pretty flowers lining the driveway. Pat loves to swim so the first thing we checked out was the swimming pool and we were not disappointed. We took a short walk following some pretty obscure directions from the concierge and an even more obscure hand-drawn map that he provided. For the most part, we were walking in the narrow, two-lane street without sidewalks. The houses were small, but clean and well kept. Most of them were guarded by fences and gates giving us the impression that security was an issue in this area. One unusual building hung out over the edge of the street and we could only guess at its purpose. 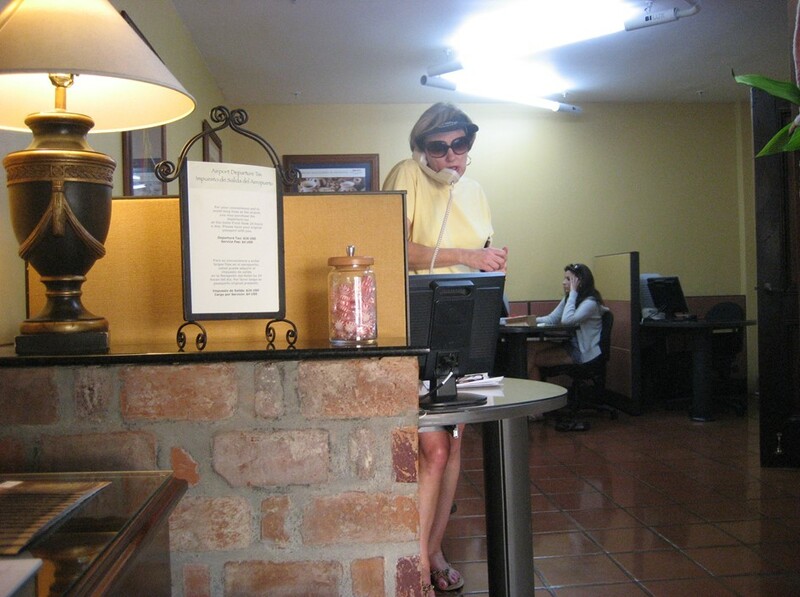 Since we were scheduled for a tour the next day, we checked in with the travel office and then the concierge. Pat did her best to figure out the best place to stay on our final night so we would be positioned to catch our flight the following Sunday. We swam in the pool for a while and then moved to the hot tub to relax. Following that we showered and changed clothes for dinner. We had decided to have our first dinner in Costa Rica in the Marriott hotel restaurant and we weren’t disappointed. The wine list was a little pricey so we enjoyed margaritas instead. Both Pat’s Mahi Mahi and my Sea Bass were excellent. The tour bus was scheduled to arrive at 7:40 AM on Sunday morning. It actually arrived at about 8:10. We could have used the additional sleep. After picking us up the bus made stops at six more hotels picking up one or two people at each. 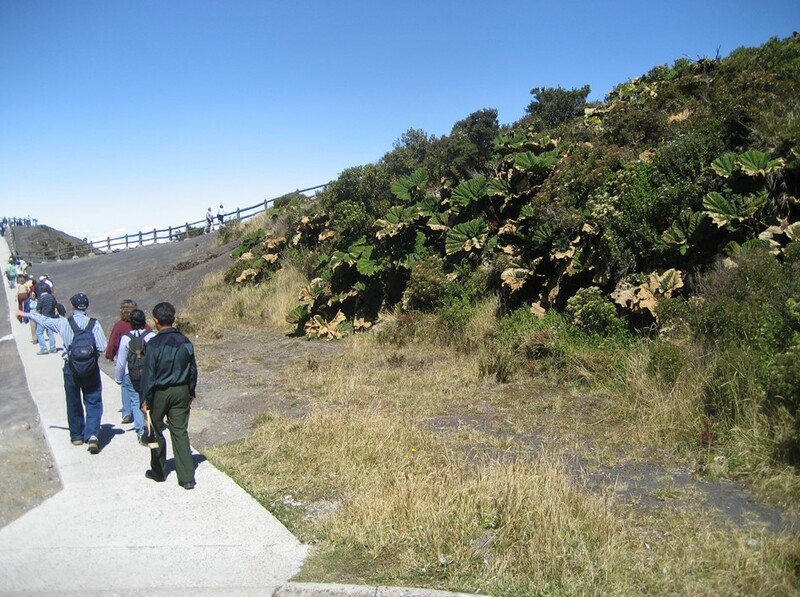 In all there were 23 of us on the tour and at about 9 AM we left San Jose for the Irazu volcano. Our tour guide was Melvin who was very friendly and asked us all to introduce ourselves. Three of the other guests were from New York, one was from Saginaw Michigan but the rest were from places other than the United States. We had people from Denmark, Canada, Venezuela, Mexico and Amsterdam. 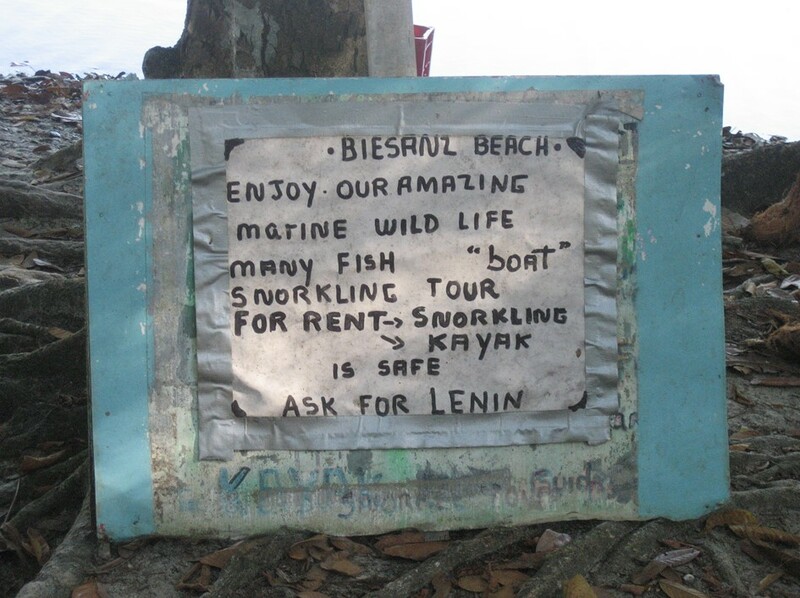 Our guide had a good command of the English language but some unusual pronunciations. For example, mountain was pronounced ‘mainton’ and Virgin Mary was pronounced Veergin with a hard ‘g’. Sometimes we better understood the English by listening to the Spanish. The drive to the volcano took us out of the city and up into the mountains. 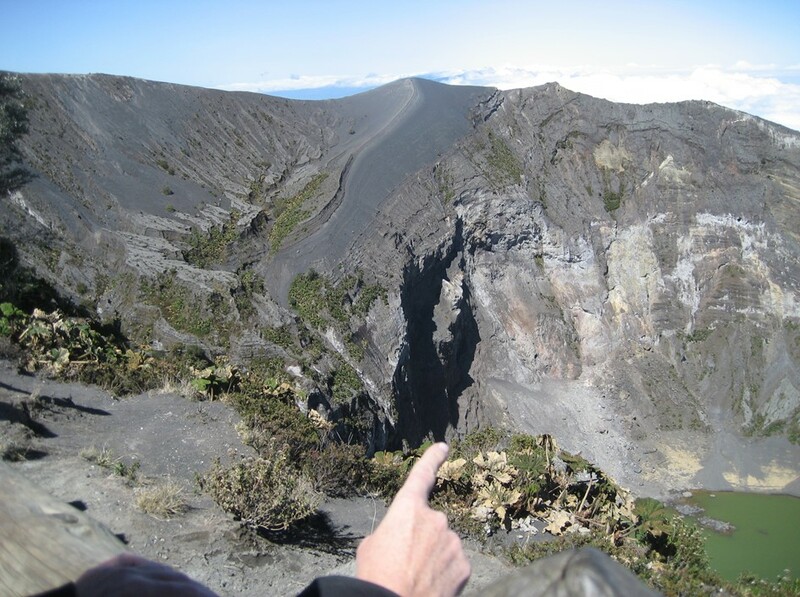 The crater of the Irazu volcano is at 11,000 feet elevation so we were driving up very steep country roads. We stopped at a roadside restaurant for a cup of coffee and a chance to get out and view the countryside. Notice the ‘A’ frame house in the background. 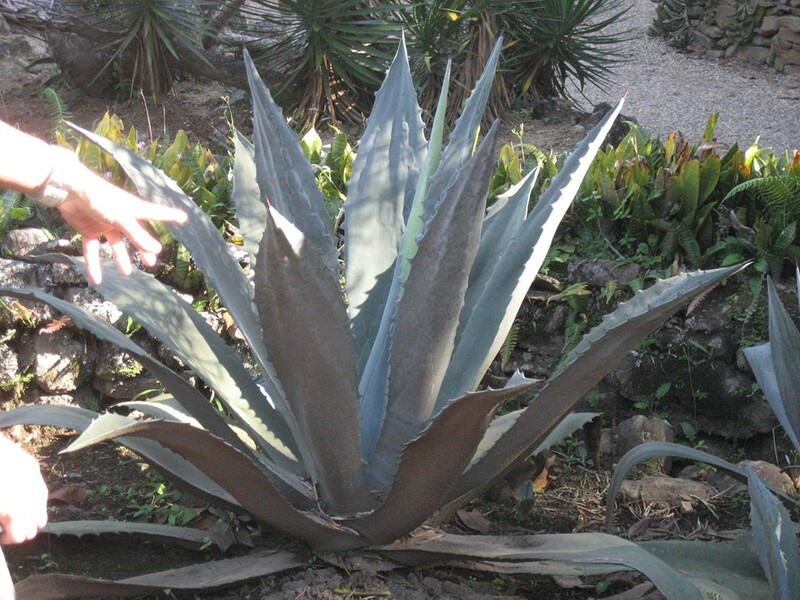 This is only one of these that we saw. The view from the back balcony of the restaurant was beautiful and by this time we were above many of the clouds. 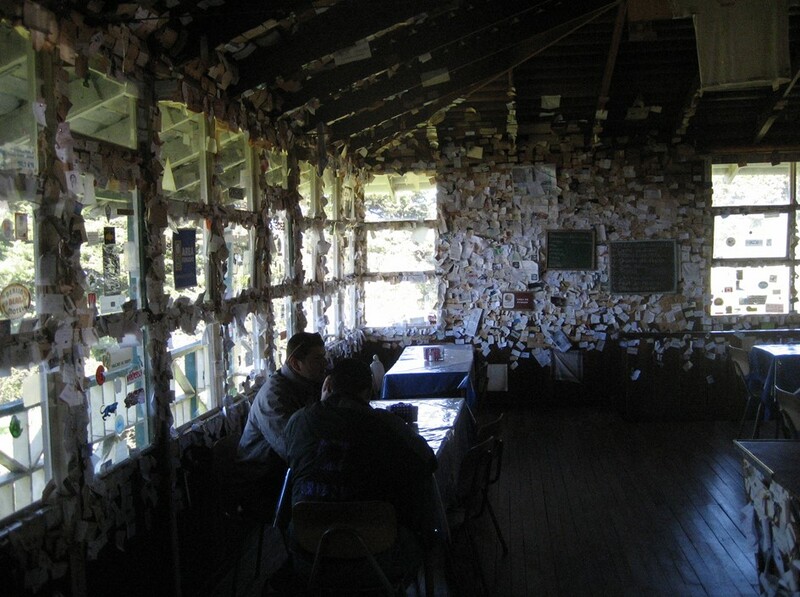 Inside the restaurant many of the thousands of visitors had chosen to staple, tape or tack their business cards or some other form of identity to the walls and the owners had left them untouched. Back on the road and still several thousand feet elevation from the crater we paused briefly on the side of the road while our guide pointed out another volcano but this one was active and not approachable. 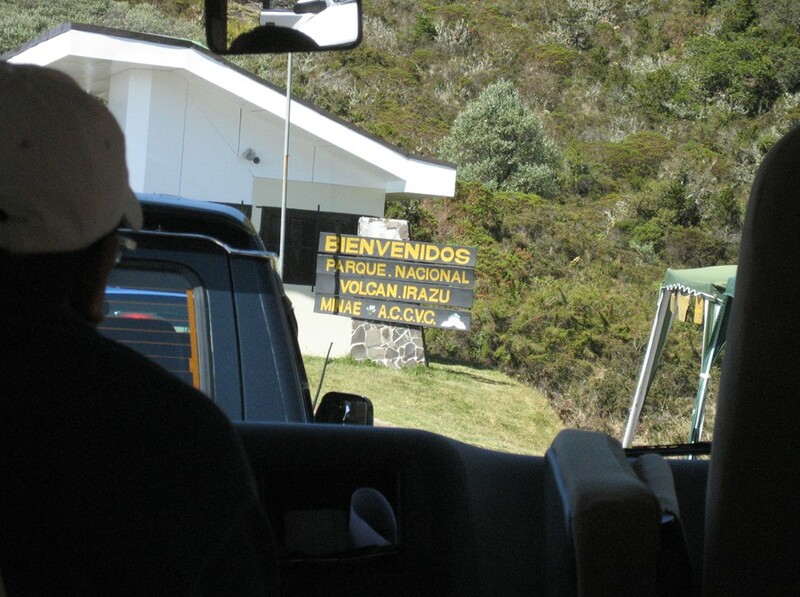 Finally we arrived at the entrance to the Irazu volcano park. We were a little miffed to have to wait in a line of about eight cars to pay our toll to enter the park. Little did we know how lucky we were. When we exited an hour later the line of cars waiting to pay their toll had stretched to about 30. From the entrance it was only about ½ mile to the parking area and then we were on foot. Keep in mind that we a walking up and down these hills at 11,000 feet elevation and it was easy to get winded. 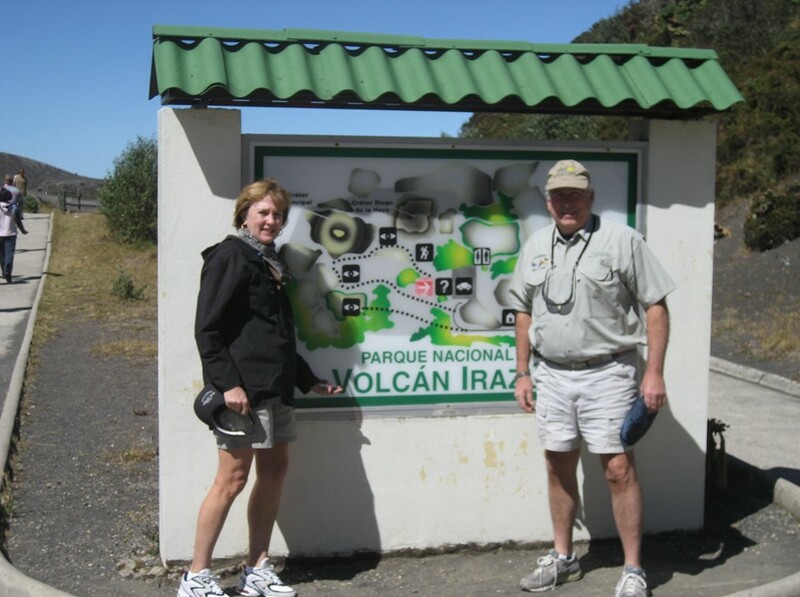 Here we are at the entrance to the walking paths. 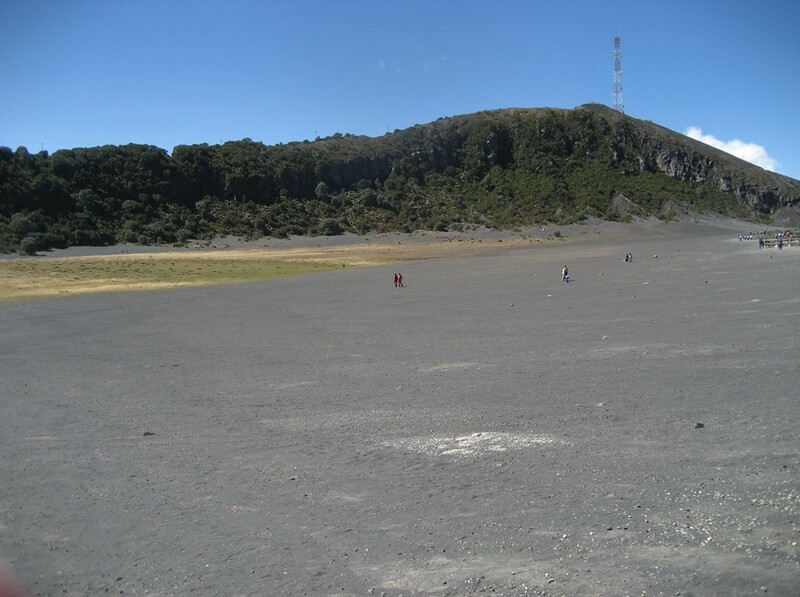 The last eruption of this volcano was in 1963 and it has been dormant since. We found ourselves walking on black sand with volcanic rock strewn about. The craters were just awesome. They were a testament to the power of Mother Nature. 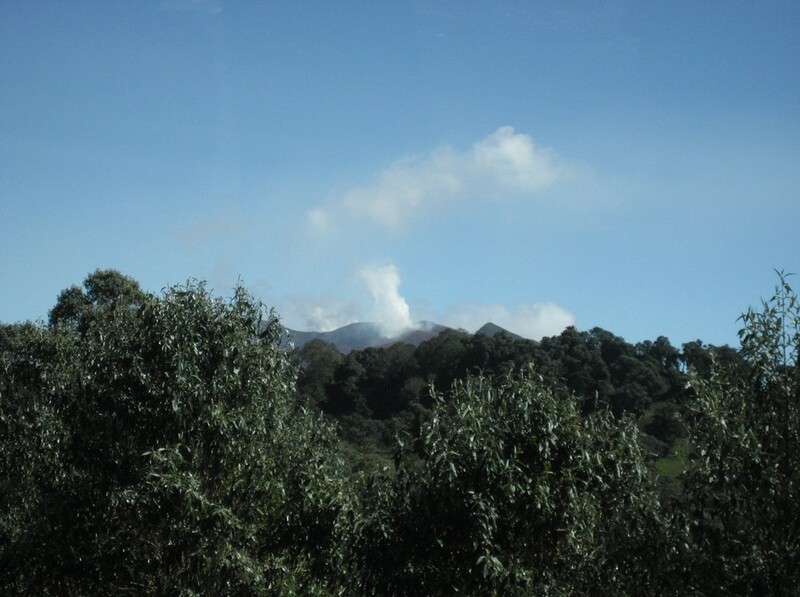 There were some fumaroles outside of the crater area that left a strong smell of sulphur in the air. 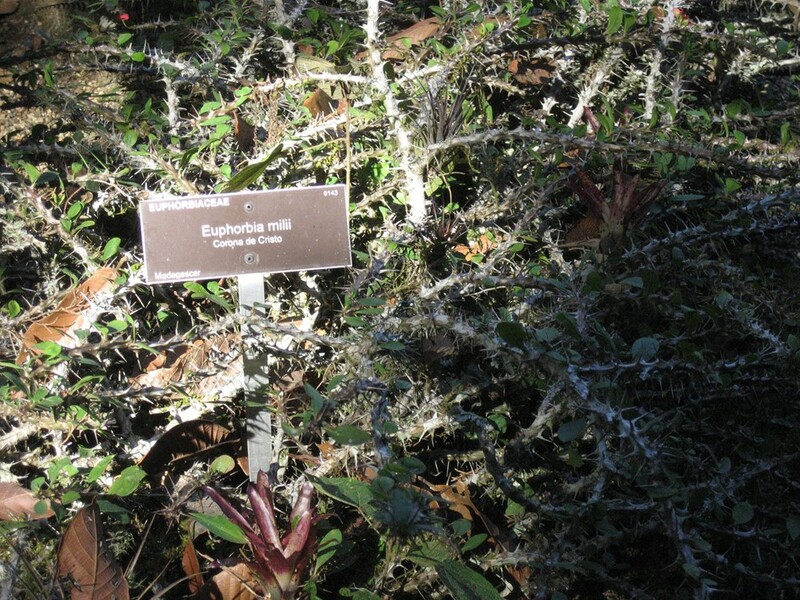 When the strong sulphur gases came in contact with vegetation it left the leaves browned as if they had been scorched. After about an hour we re-boarded the bus and headed back down the mountain. 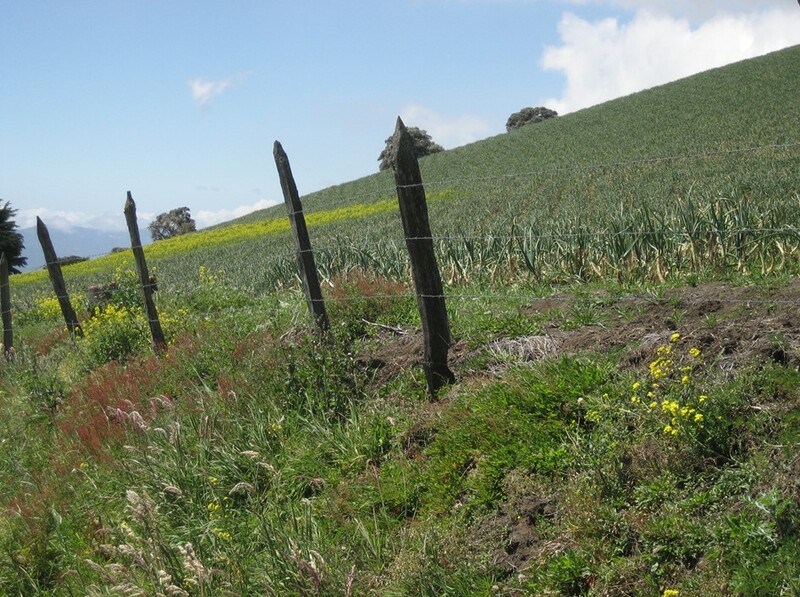 Our guide pointed out that the major crops for this area were potatoes, onions, and garlic. 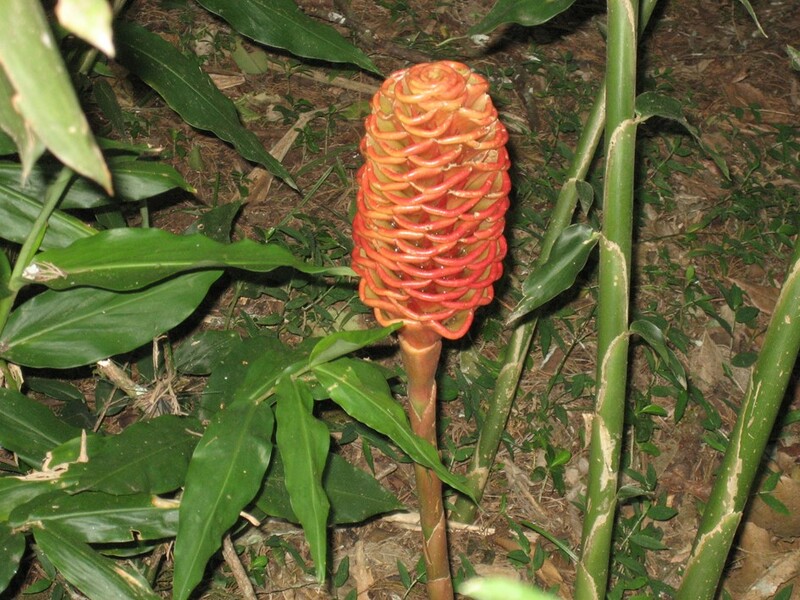 There were frequent roadside stands selling the freshly harvested produce. 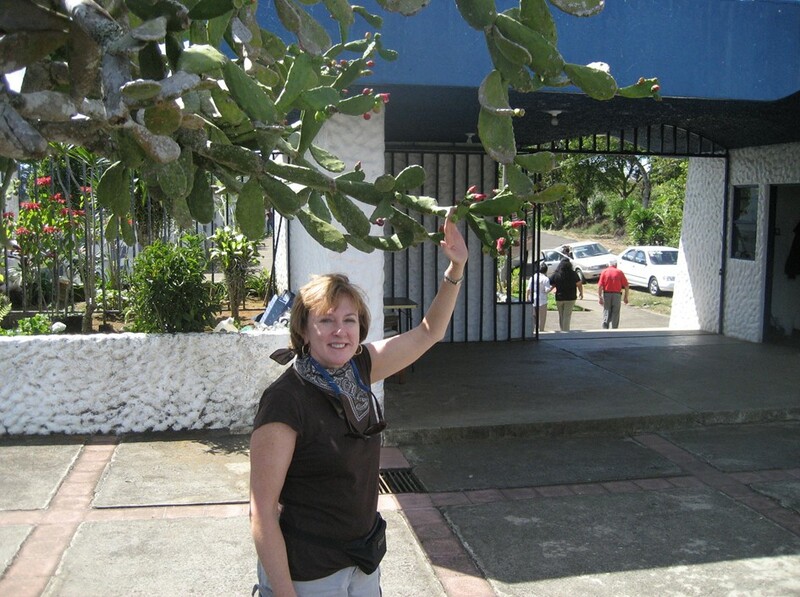 We stopped briefly at the town that used to be the capitol of Costa Rica but had been destroyed in the volcano eruption of 1916. 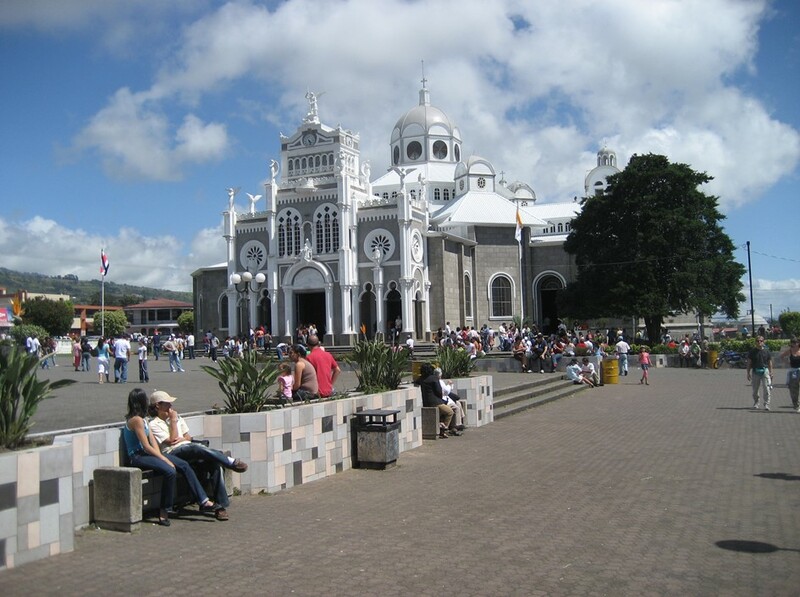 The newly constructed church was the center of attention on the plaza. 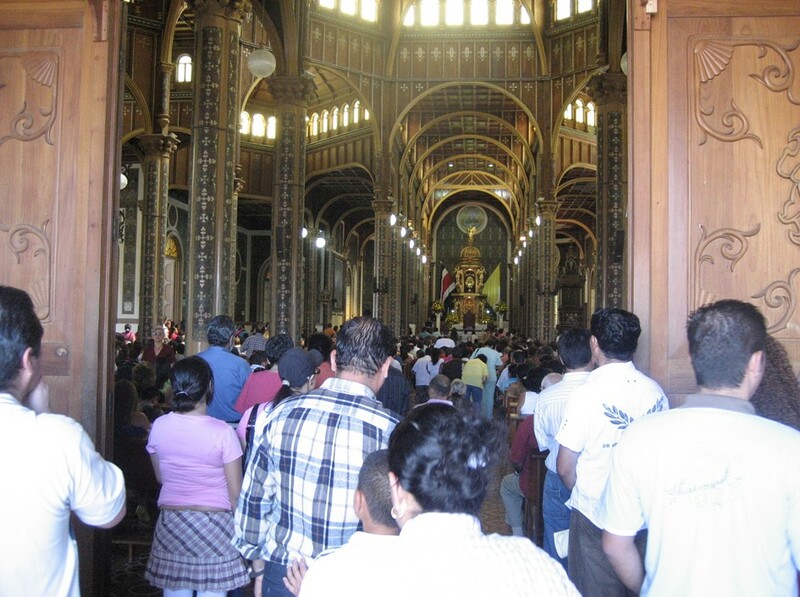 We visited the church that was in the middle of Sunday mass. The ceiling structure and the stained glass windows were just beautiful. 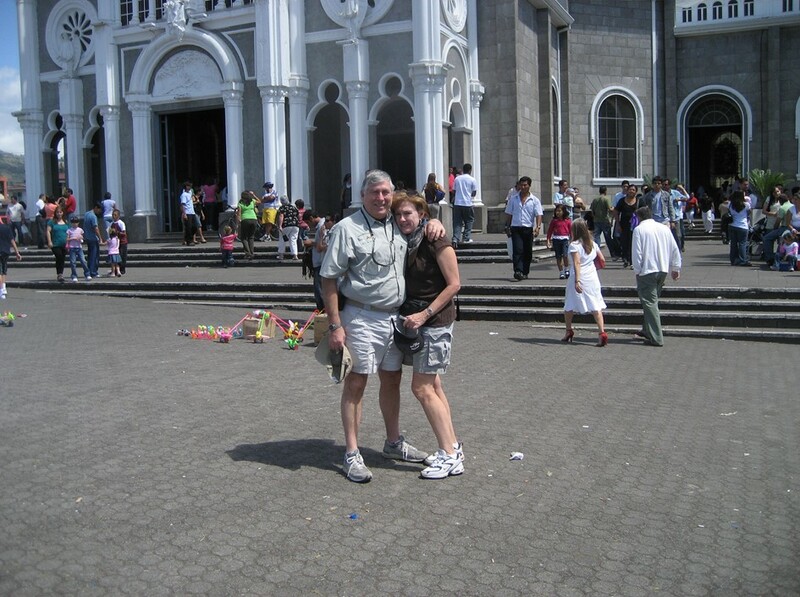 Here we are on the Plaza Del Santuario Nacional in front of the church. We boarded the bus again and headed further down into the valley to the Mirado Ujarras. This is deep valley with a large dammed lake at the bottom. We first stopped at the observation area over looking the lake. The views were spectacular and we just couldn’t help but have our pictures taken looking over this valley. 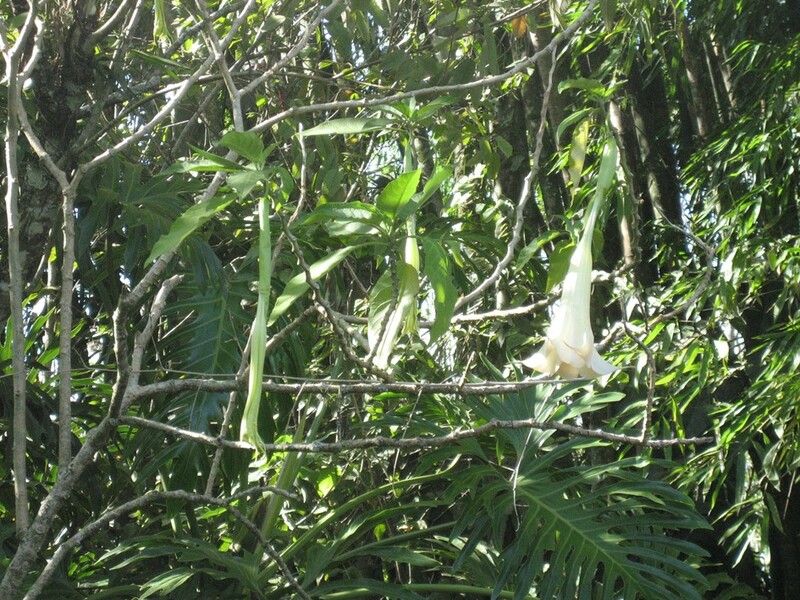 Everywhere we looked the trees and flowers were beautiful. Then, once again, it was back onto the bus for the drive down into the valley and over the dam. Just around the corner from the dam was a lovely restaurant overlooking the lake. And again, the flowers were beautiful. 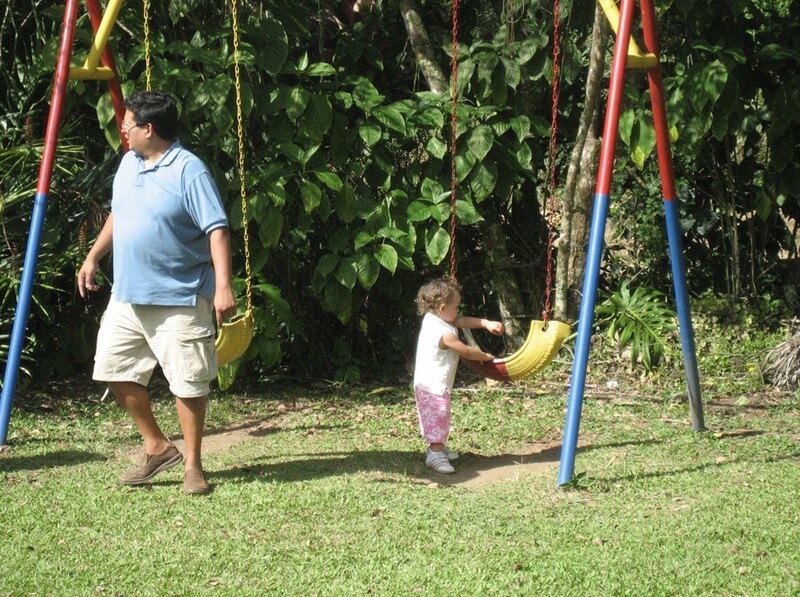 There was a cleverly made swing set to keep the children entertained. 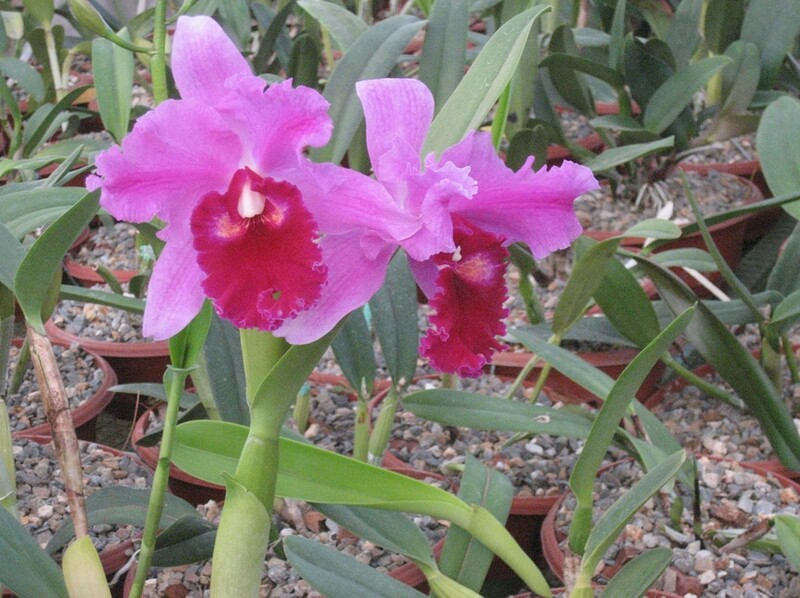 After a really wonderful buffet lunch we once again boarded our bus to drive to the botanical gardens. Along the way our guide described a new highway that had been built by the government of Costa Rica to expedite travel from the Atlantic to the Pacific. 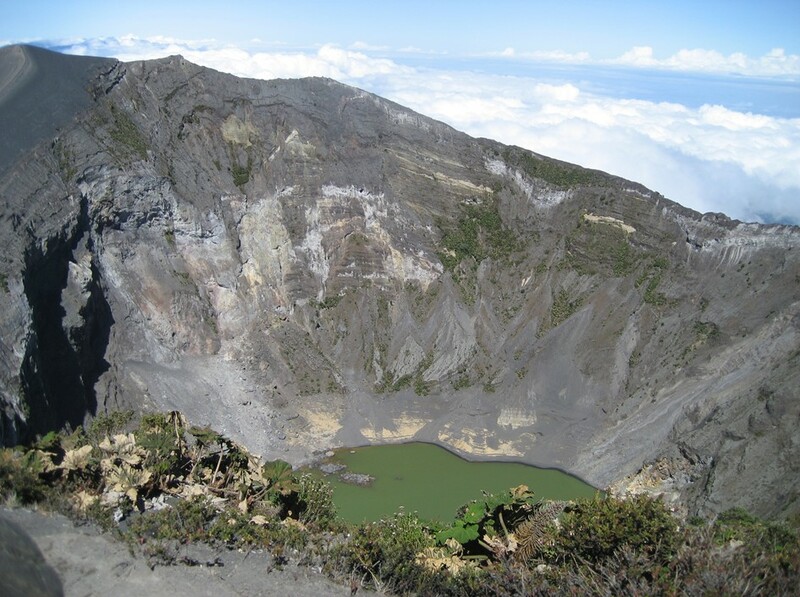 It was built near the narrowest point of Costa Rica and was only 73 miles long. Our guide informed us that the entire route could be driven in 5 to 6 hours. We were a little stunned to think that 73 miles would take 5 or 6 hours to drive. 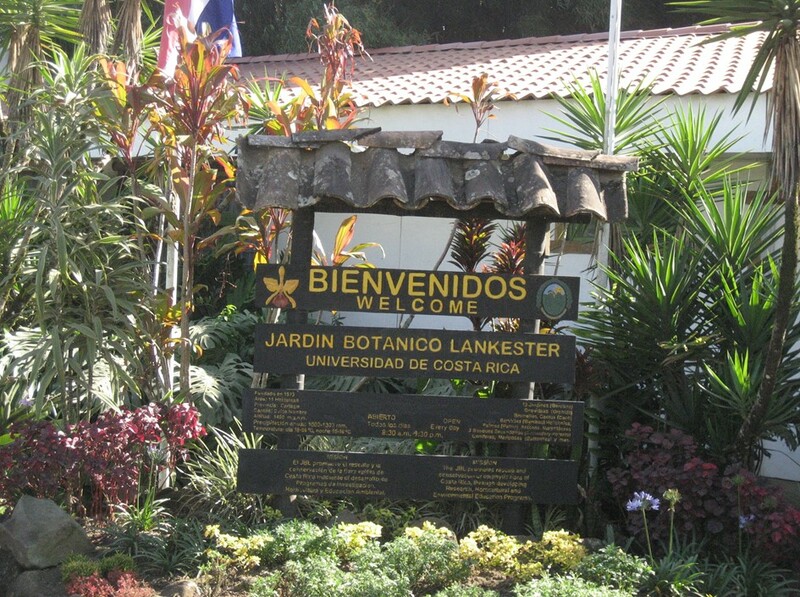 We finally arrived at the botanical gardens, which were named ‘Jardin Botanico Lankester’ in honor of the man who created the garden and turned it over to the University of Costa Rica following his death. 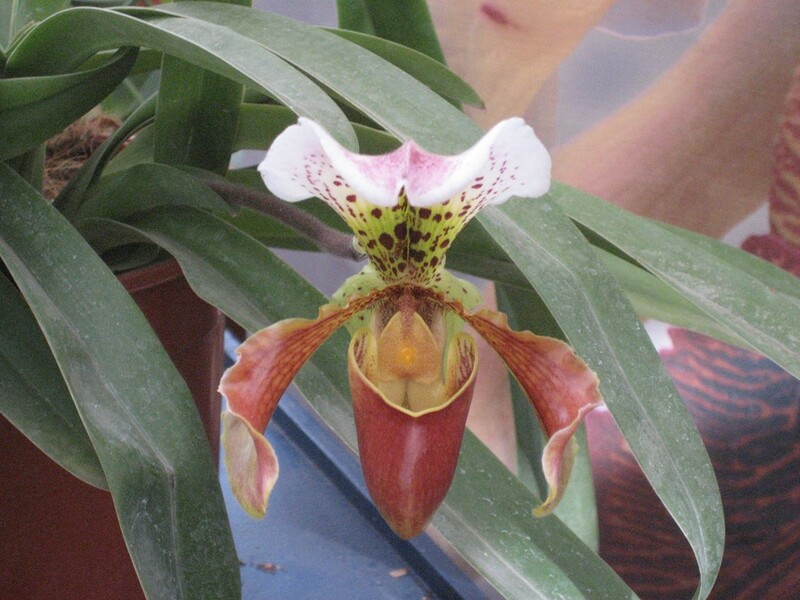 Inside the main building was the orchid house. 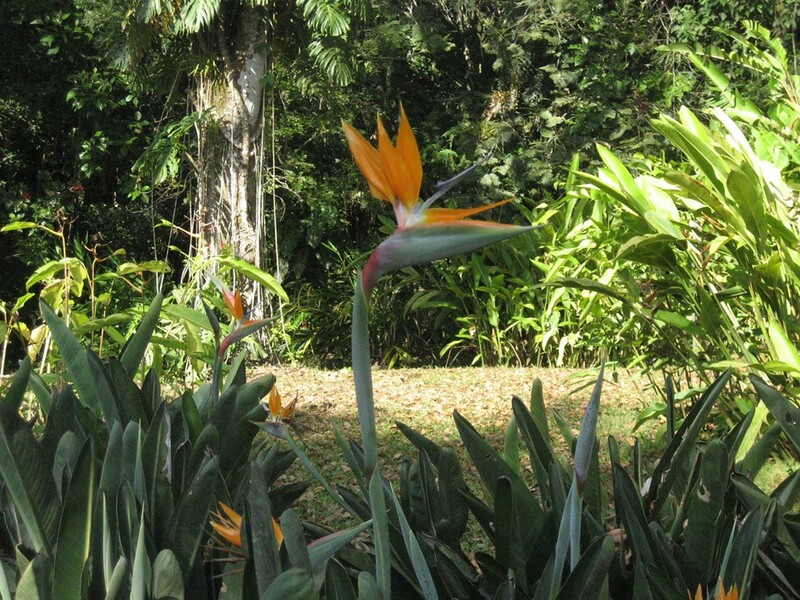 We were told that the orchid is the national flower of Costa Rica. 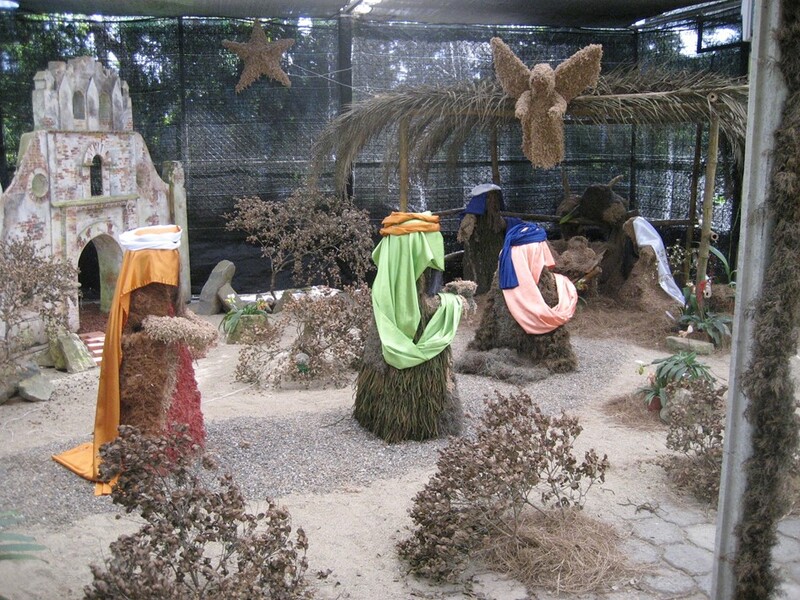 The Botanical garden had a crèche still set up from Christmas. 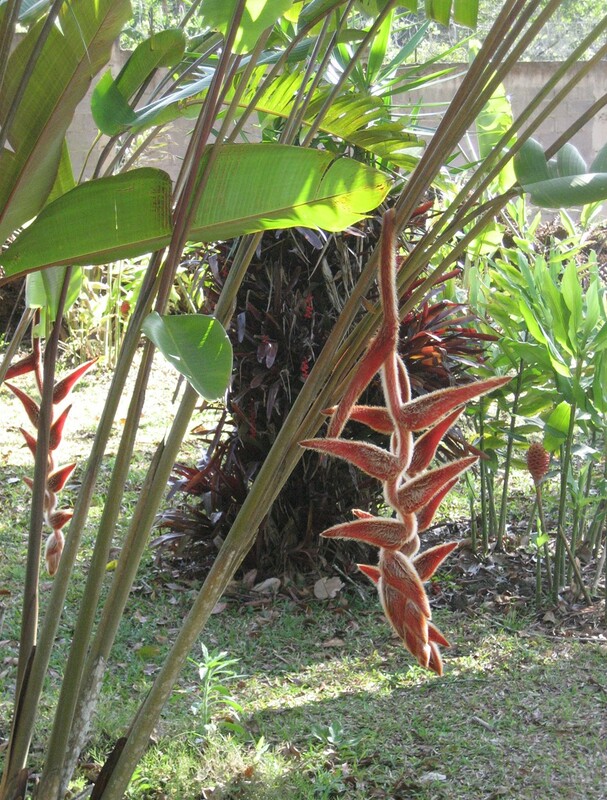 The whole scene was setup using plants and plant by-products. 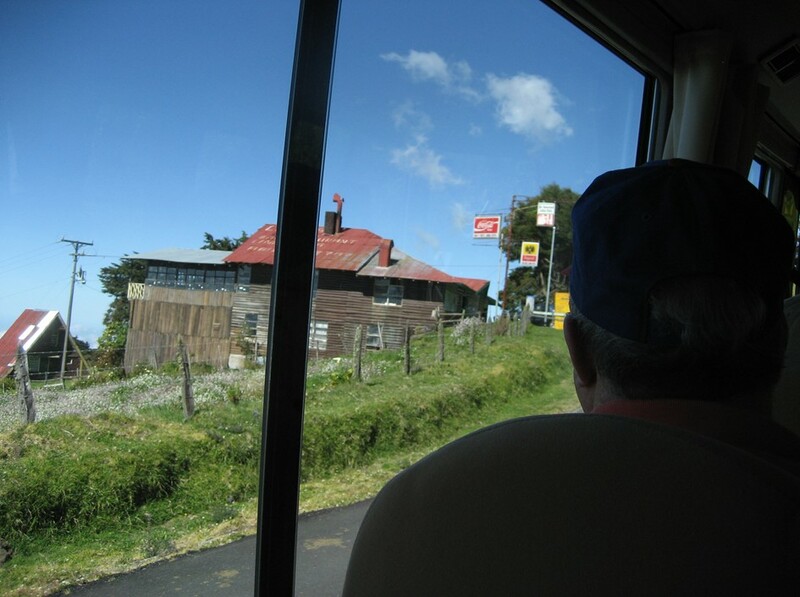 At about 3:30 pm we climbed onto the bus for the final time and headed back to the city of San Jose. This night we were pointed toward a wonderful Italian restaurant called Antonio’s. It was a short taxi ride away and served a truly delicious meal. 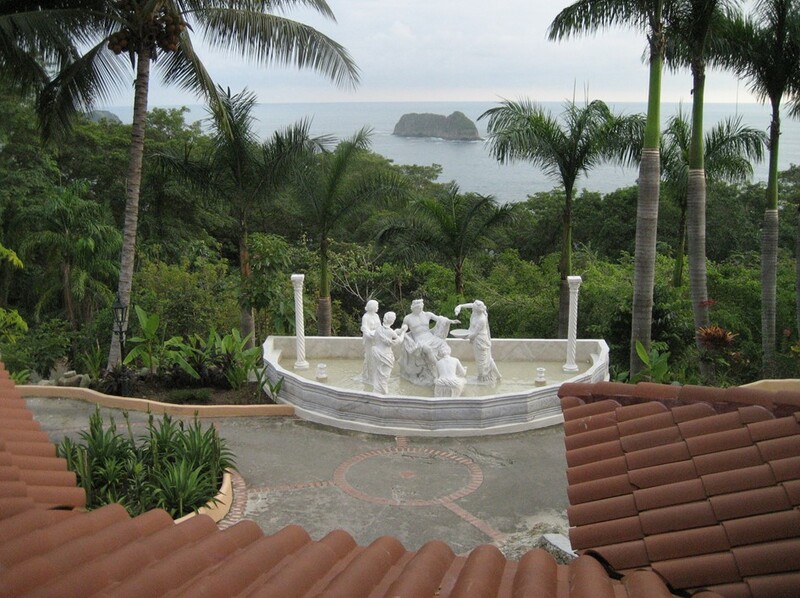 Tomorrow, Monday, we intend to leave for Quepos, but we still don’t have a rental car. 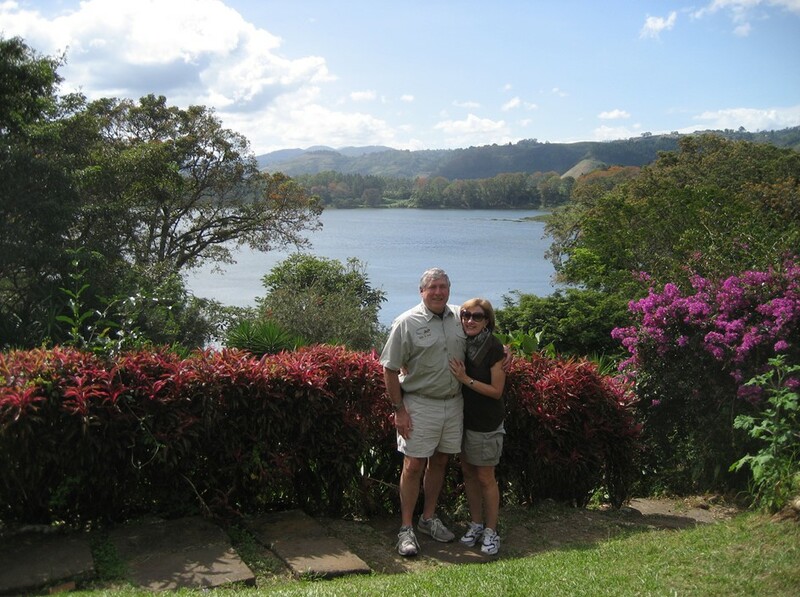 We decided to leave San Jose on Monday, which was a day earlier than originally planned. In order to leave we had to pick up our rental car a day early. We started calling Europcar Sunday afternoon. No one answered. On Monday we started working with our hotel concierge to help us with the language and finally he was able to get someone on the phone. Europcar, however, reported that they had no cars available. They promised to call our hotel and let us know if one were to be returned. “No”, they couldn’t tell us if one was due to be turned in. We relaxed at the pool for the morning but had to make a decision by noon on whether to stay an additional night. At 11:00 am, I made a last-ditch call to Europcar and sure enough they had a car. About 2 hours later (signup was slow) we had our car and left for the Pacific coast. 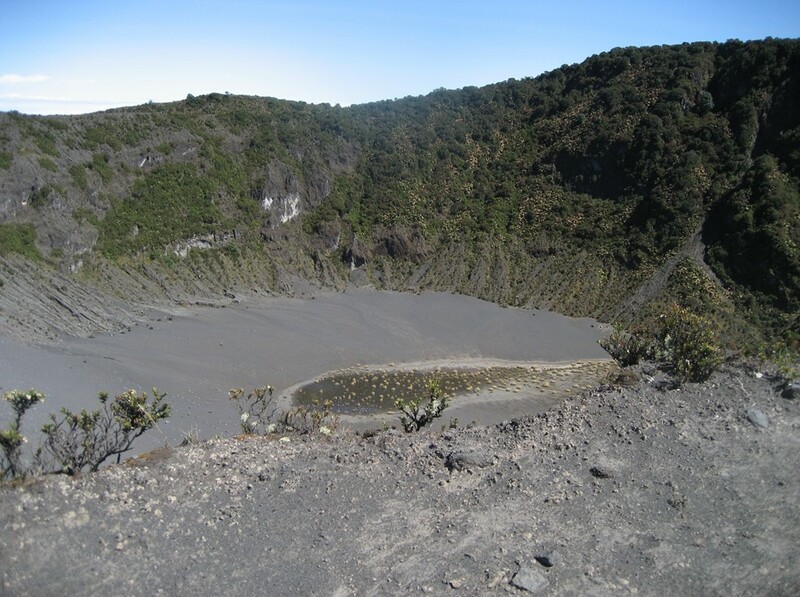 The travel guide books all warn the visitor about the terrible condition of the roads in Costa Rica and the lack of signs on the highways. We expected the worst and knew we were in for an adventure. In fact, we were pleasantly surprised. 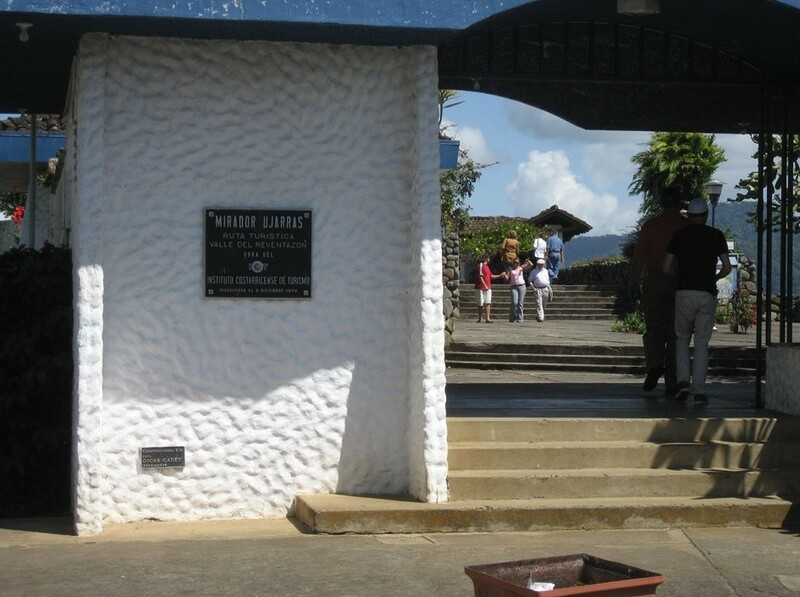 It was about a two and a half hour drive to Quepos on the Pacific side of Costa Rica. One of the staff at the Marriott told us to expect a 5-hour trip. 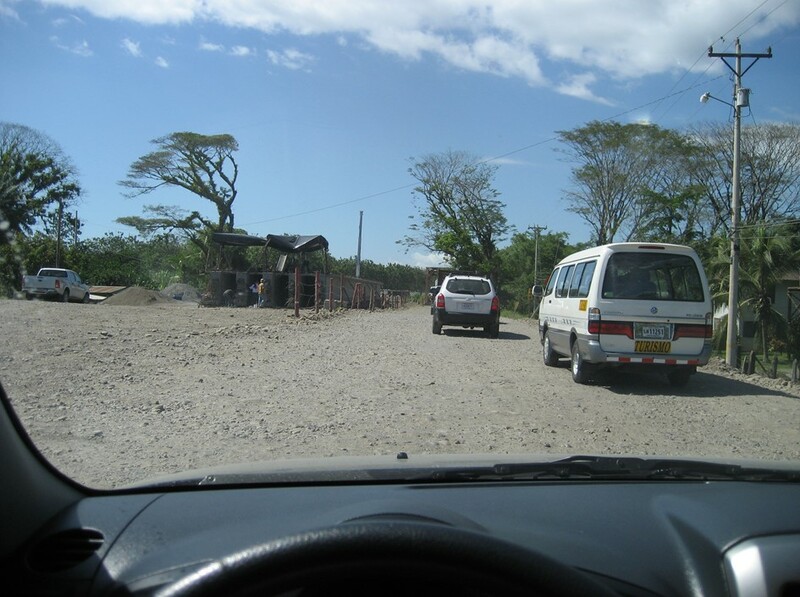 The vast majority of the trip was on reasonably well paved, two lane roads. Where we needed them, the signage was adequate. 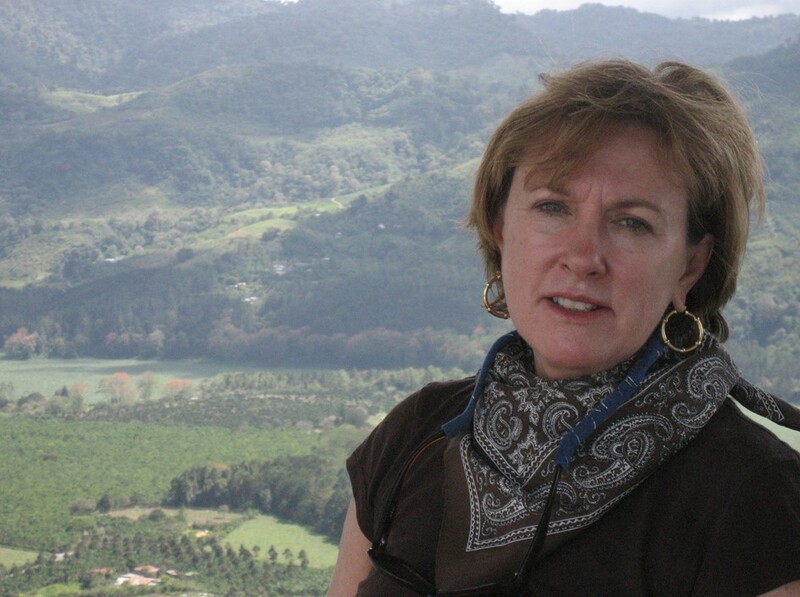 It is impossible to adequately describe the mountain driving conditions in Costa Rica. These are ‘new’ mountains that are still rising. The roads must make their way up and down incredibly steep hillsides so they weave back and forth. At times it appears to the driver that the road ahead just disappears under the windshield. The roads are never more than two lanes causing long lines to form behind large trucks and buses as they crawl up and down these roads. 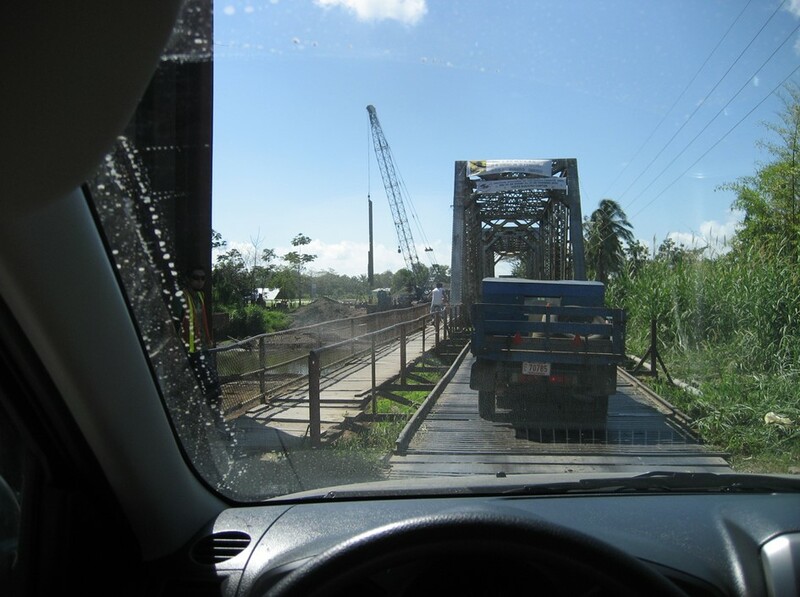 There were two spots on the highway between Jaco and Quepos where bridges were under construction but not yet complete. 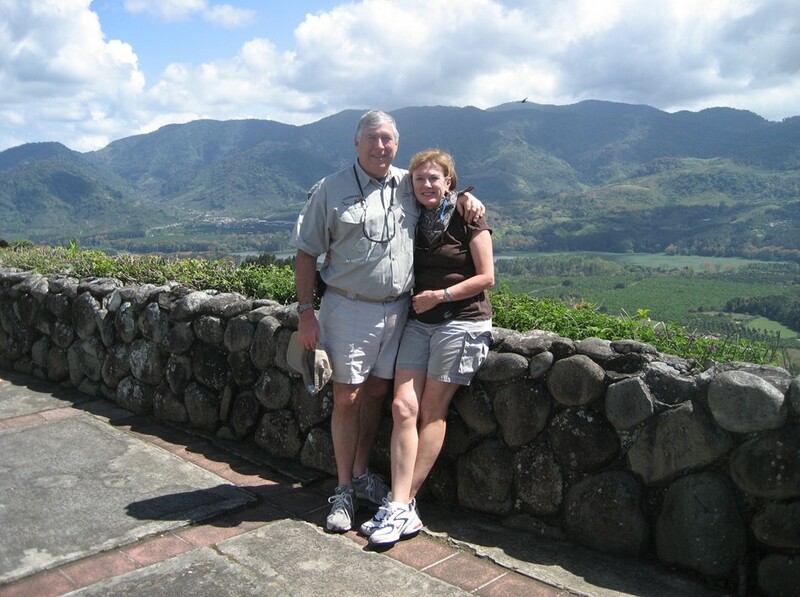 These two gave us a glimpse of what the guidebooks were talking about. 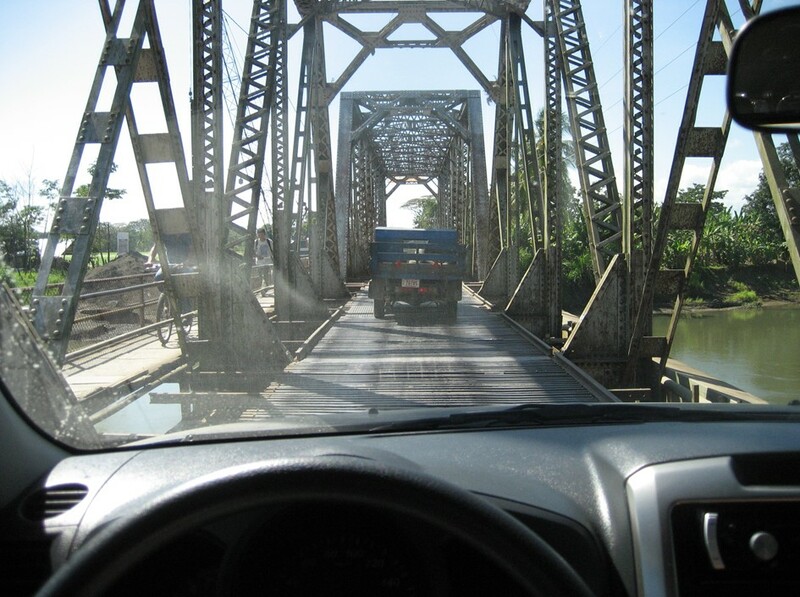 In order to cross the river at these two points, the driver had to wait his turn to cross a one-lane bridge whose surface had been patched and repaired with wood, metal and anything else that could be found. On the bridge above, welders were standing by at the center of the bridge to make emergency repairs as necessary. 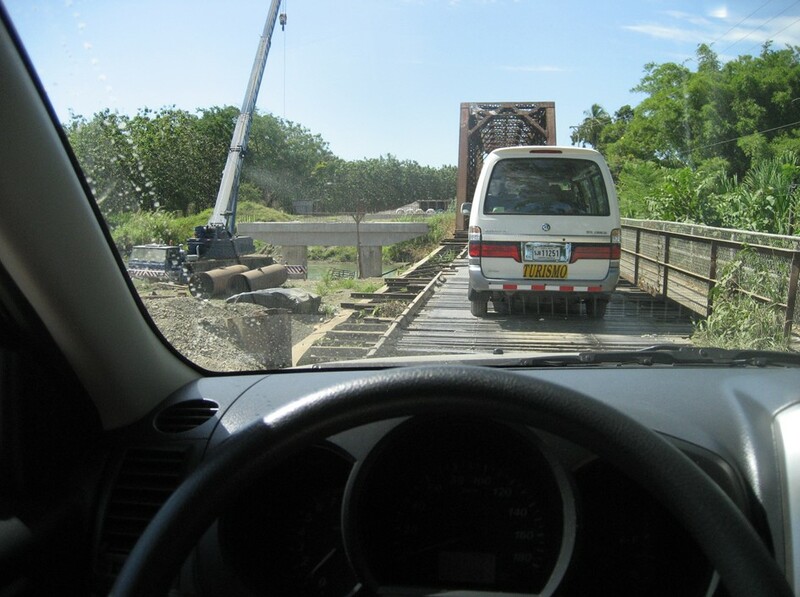 The roadway surface in the front and back of the bridges was well worn and rutted rock that bounced the vehicle about. Not too many years ago this was the road surface for the majority of the trip. At the bridge below we had to wait almost ½ hour on the return trip while cars coming the other way crossed the one lane bridge. There was no flagman or other means to encourage taking turns. 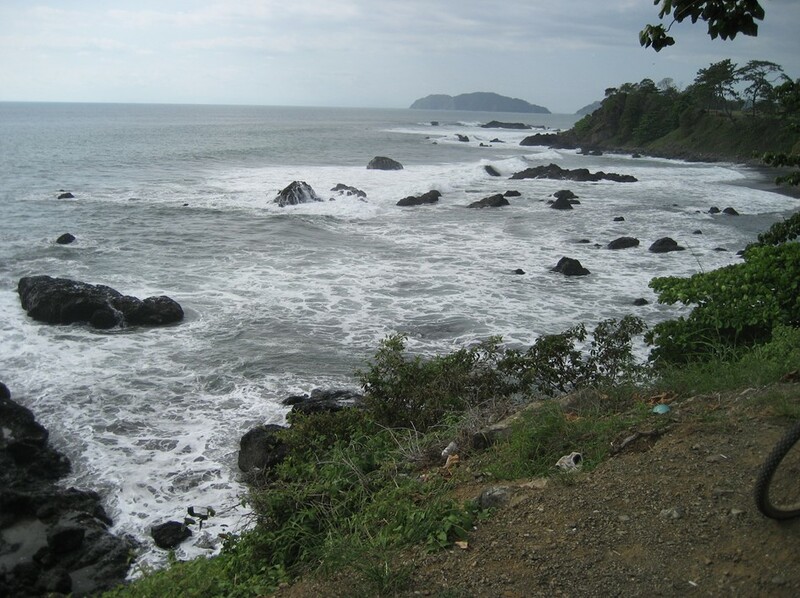 As we approached Quepos we were welcomed by our first glimpse of the Pacific. 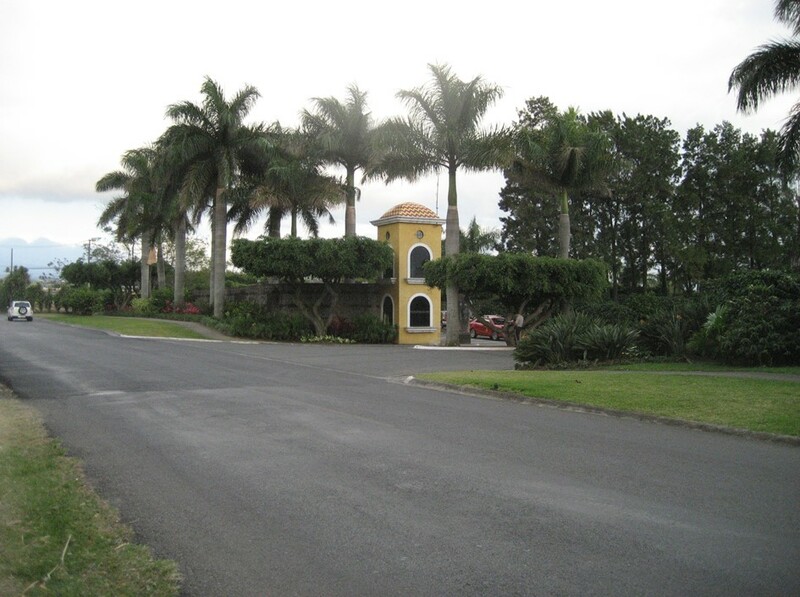 We drove into Quepos and right out the other side having missed the turn off to our hotel. This was quickly corrected with some excellent directions and a new, more detailed map. 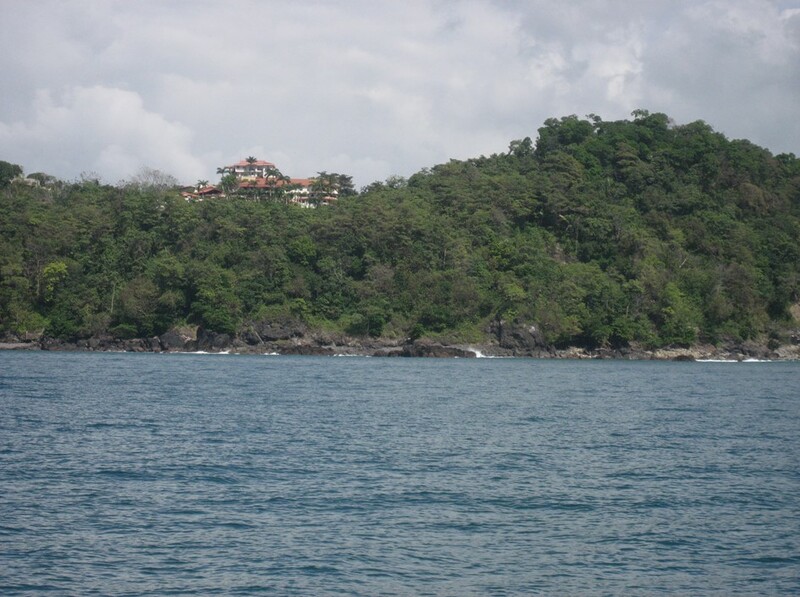 We wound our way up the hill toward the Manuel Antonio National Park and made the right turn toward our hotel. Driving the short distance from this turn off to our hotel became its own adventure. 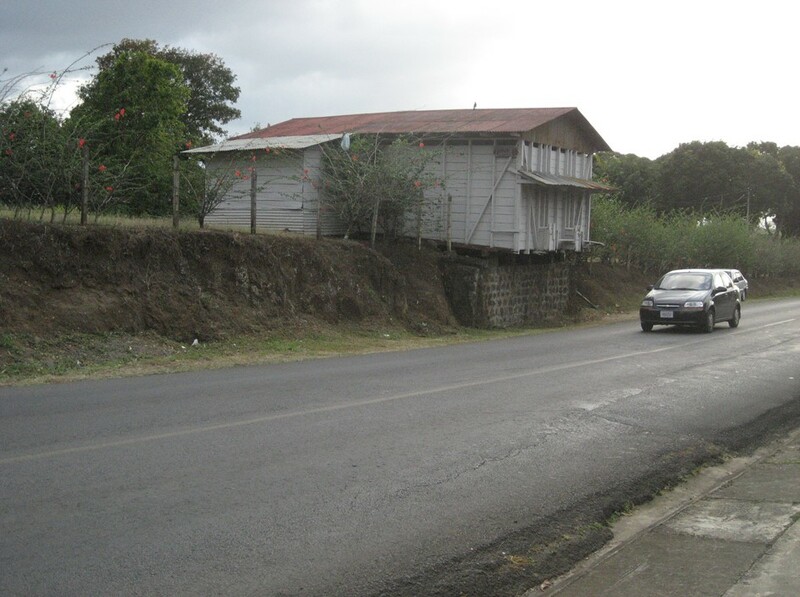 This was another, old-style Costa Rican rock road that climbed up and down steep roads and around hairpin turns. At various times we were convinced that this just couldn’t be the right road to our hotel. But it was. On this night we were glad to have arrived safely and enjoyed cocktails and dinner at the hotel restaurant. Tuesday morning before breakfast we walked down to the local beach. This was good brisk exercise because the terrain is so steep. Wherever there are tourists one will find entrepreneurs. We returned to the hotel in time for the buffet breakfast. 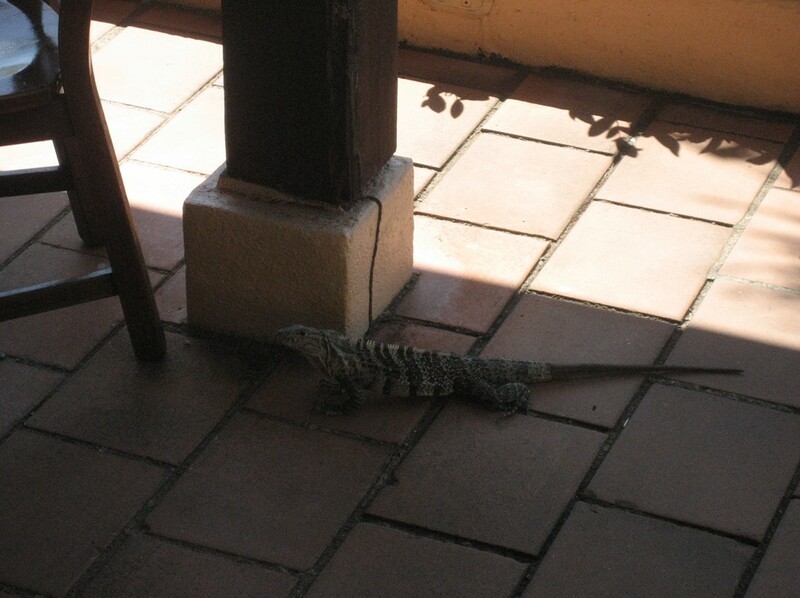 As we enjoyed breakfast we became acquainted with some of the local wildlife. 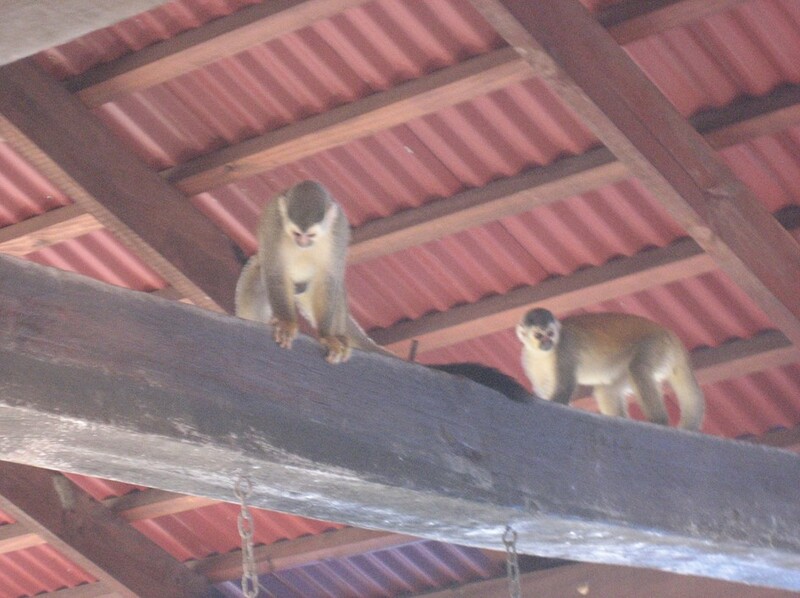 Some squirrel monkeys visited the pool bar to look for any food that might have been left out. 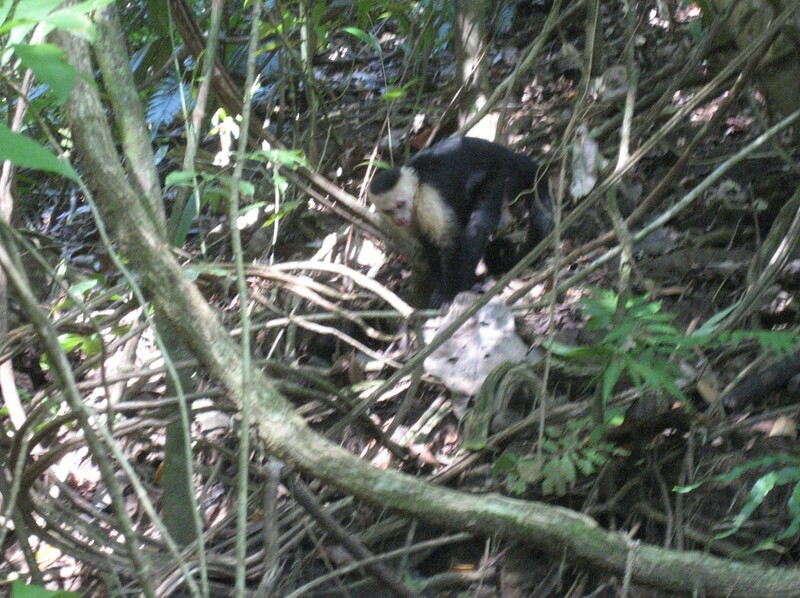 These monkeys were regular visitors and well known to the staff. 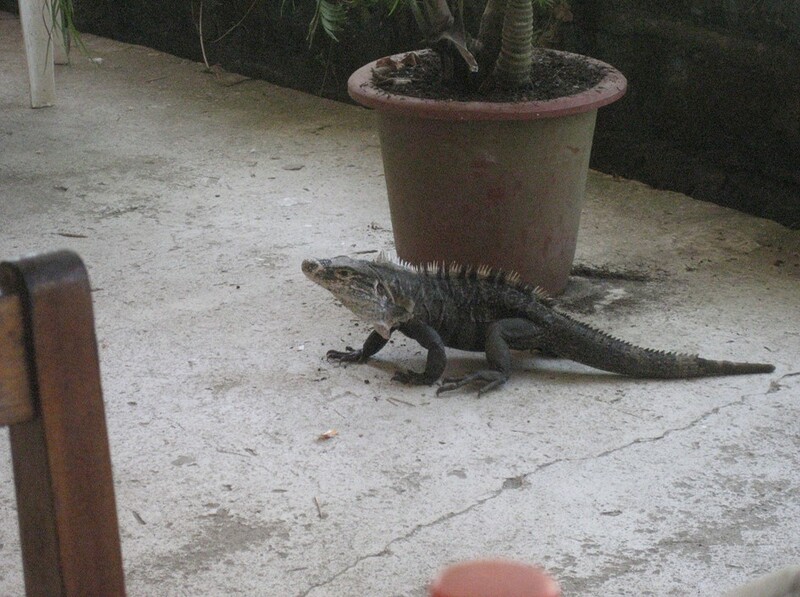 As were the iguanas that showed up at breakfast time to look for handouts. One little girl threw them cheerios that were quickly gobbled up. We spent most of Tuesday at the hotel swimming and getting oriented. We drove back into Quepos to stock up on sodas and snacks. On Tuesday night we decided to dine at the El Avion restaurant near our hotel. 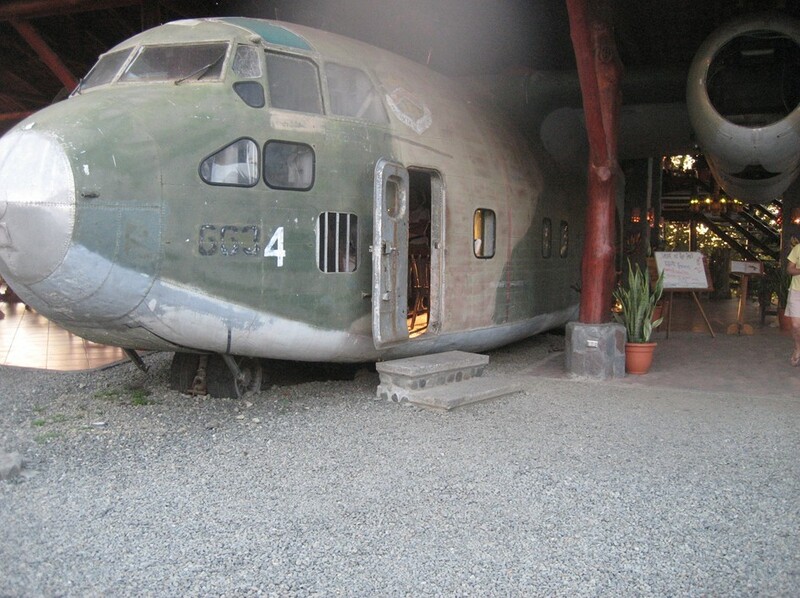 This restaurant was built around an old C-123 with a colorful history. The emblem on the side indicates that the plane was once with the 439th Tactical Airlift Wing of the U. S. Air Force. Our Fairchild C-123 was a part of one of the biggest scandals in the mid 1980’s. During this time, the Reagan Administration had set up a bizarre network of arms sales to Iran designed to win release of U.S. hostages being held in Lebanon and raise money to fund the Nicaraguan, counter-revolutionary guerilla fighters, commonly referred to as the “Contras.” By artificially inflating the prices of the arms, NSA official Oliver North was able to reap profits that could be diverted to fund the counter-revolutionaries of the Cuban allied Sandinista government. 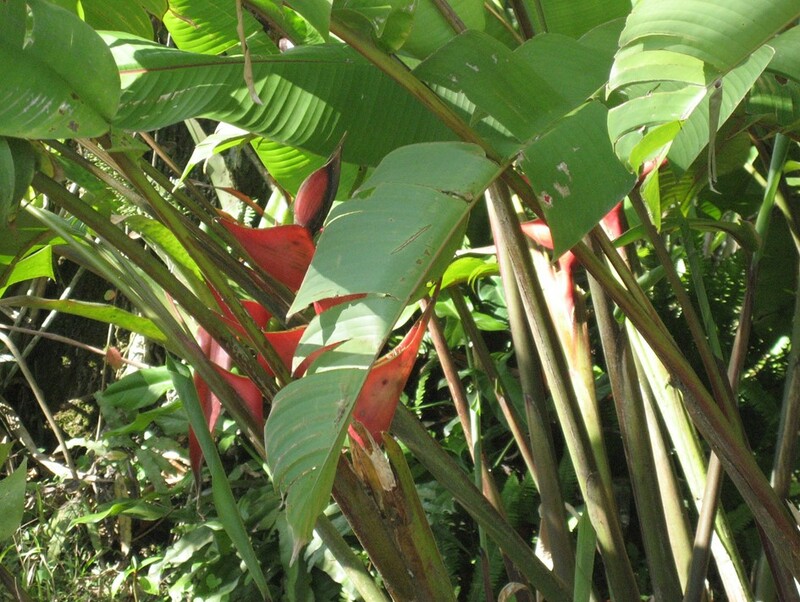 Of the $16 million in profits raised, only $3.8 million actually funded the Contras. With the CIA’s help, they purchased several items including two C-123 cargo planes (one of which is our plane), two C-7 planes, a Maule aircraft, spare parts, and munitions. 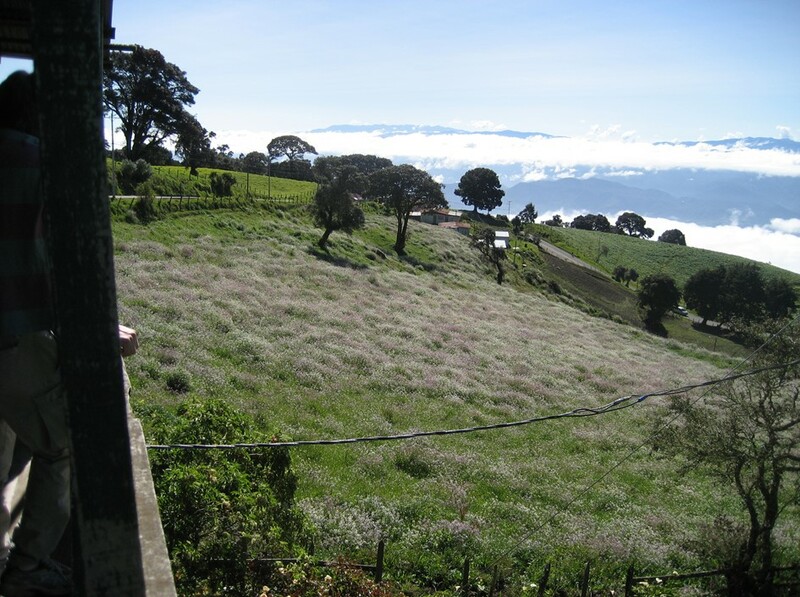 They also built a secret airstrip on the American-owned, 30,000-acre ranch in northwest Costa Rica. 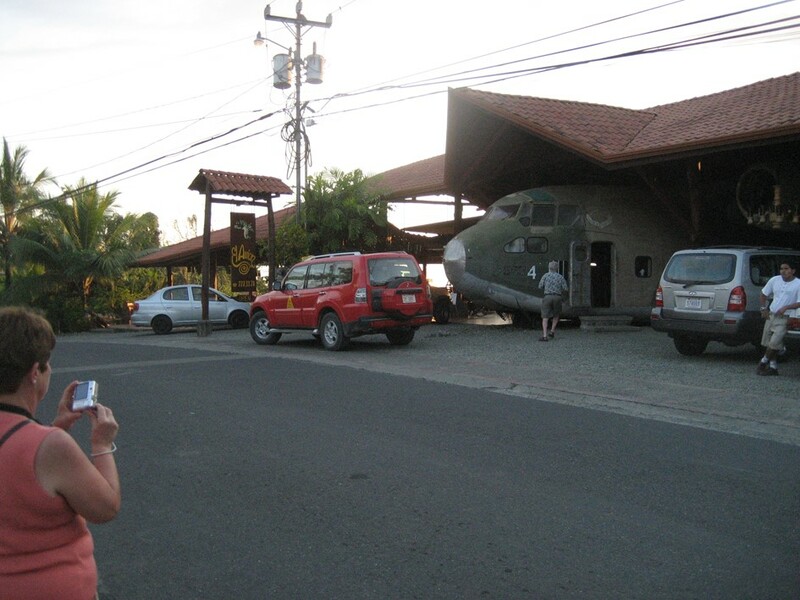 On October 5, 1986, a U.S. cargo plane, the twin sister of El Avion’s own Fairchild C-123, was shot down over southern Nicaragua. 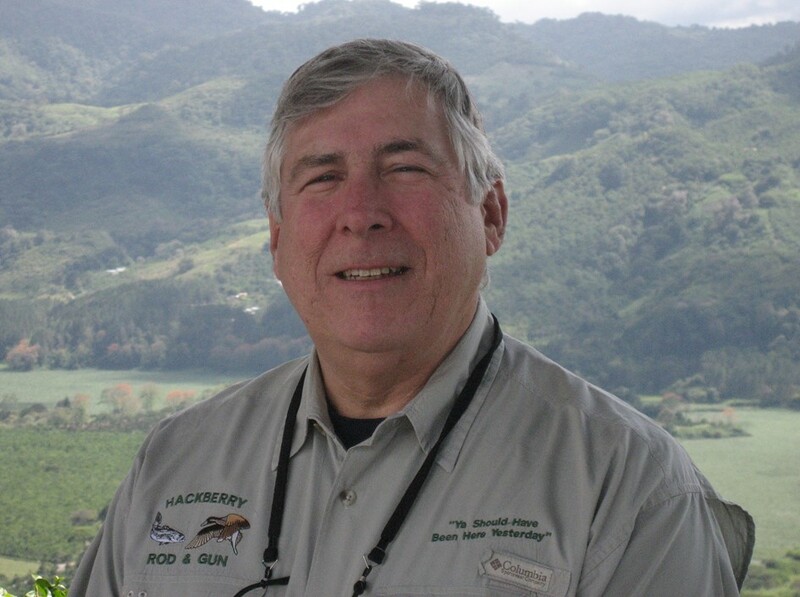 One of the crewmembers, CIA operative Eugene Hasenfus, parachuted to safety and was captured by the Sandinista army. Led out of the jungle at gun point, Hasenfus’s very existence set in motion an incredible chain of cover-ups and lies that would mushroom into one of the biggest scandals in American political history known as the Iran-Contra Affair. As a result of this successful Sandinista strike on our Fairchild’s sister plane, the cargo operation was suspended and one of the C-123s was abandoned at the International Airport in San Jose. 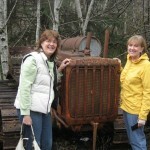 In August 2000 we purchased the abandoned Fairchild for $3,000. We then disassembled and shipped the pieces of the Iran-Contra relic to Quepos. 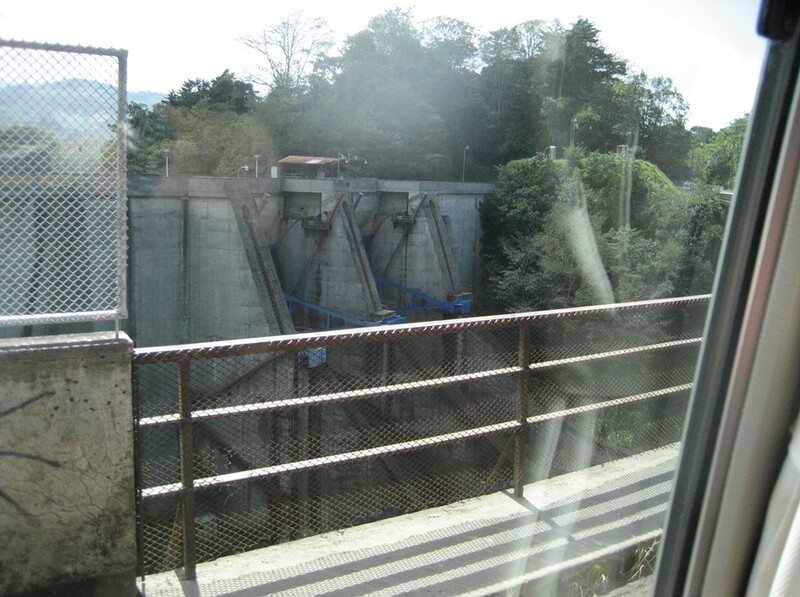 From San Jose the fuselage was shipped via ocean ferry from Caldera to Quepos because it was 10 inches too wide for the antiquated Chiquita Banana railroad bridges! 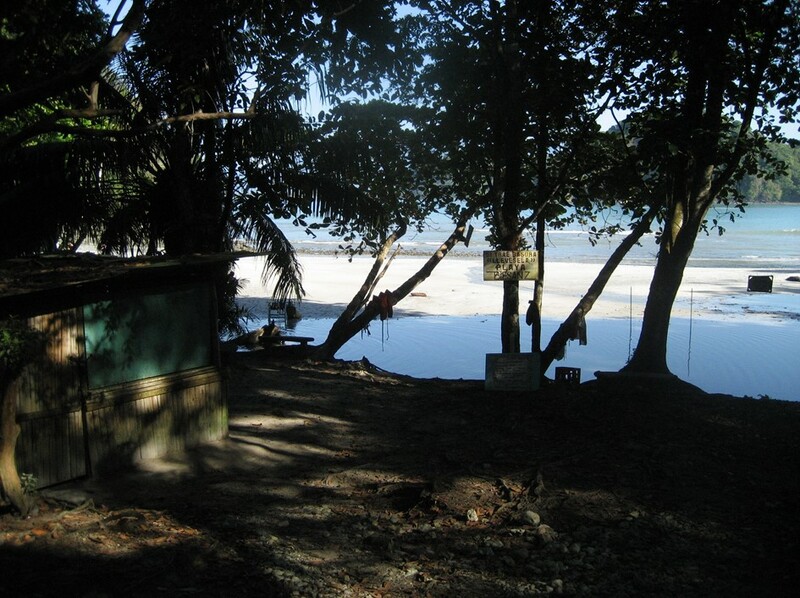 After hauling all seven aircraft sections up the Manuel Antonio hill, the C-123 finally found its current cliff-side resting place. 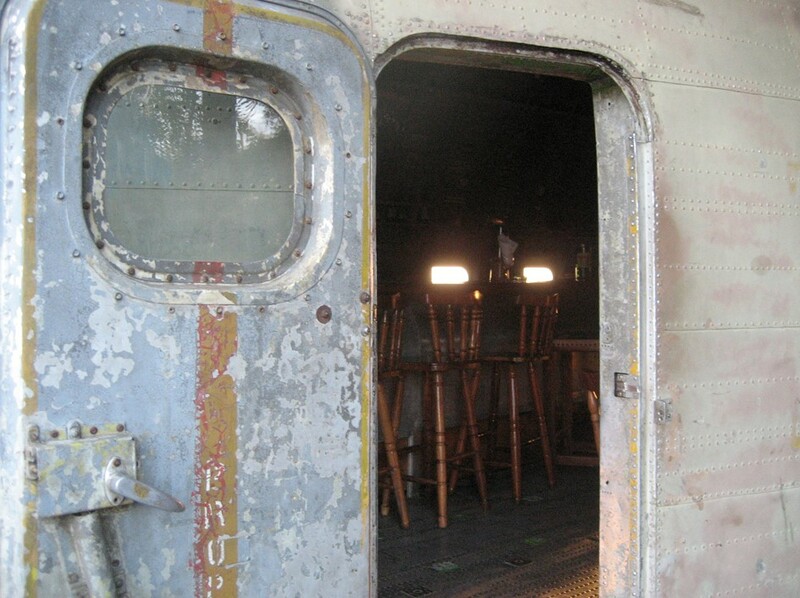 From the picture below one can see how they have constructed the “Contra” bar inside the fuselage of the C-123. 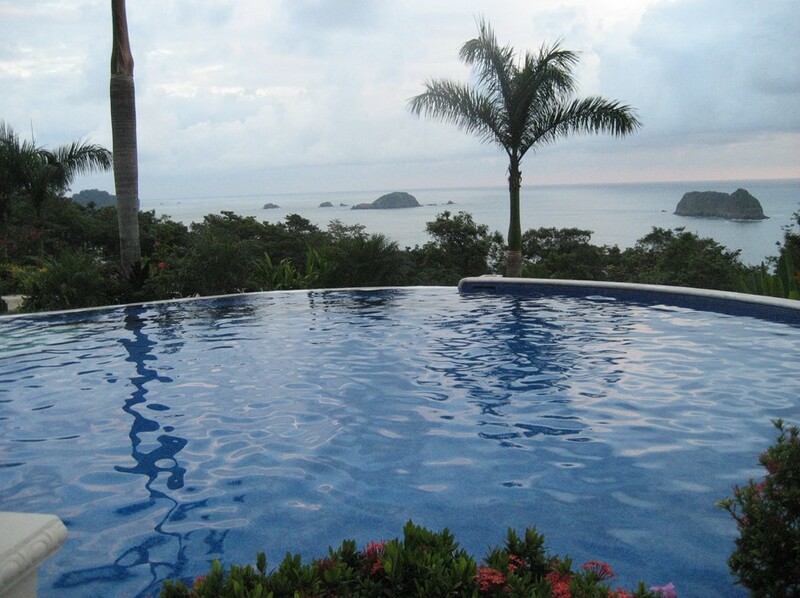 Wednesday morning we enjoyed the breakfast buffet and then boarded the 8:15 am bus for the Manuel Antonio National Park only about 20 minutes away. 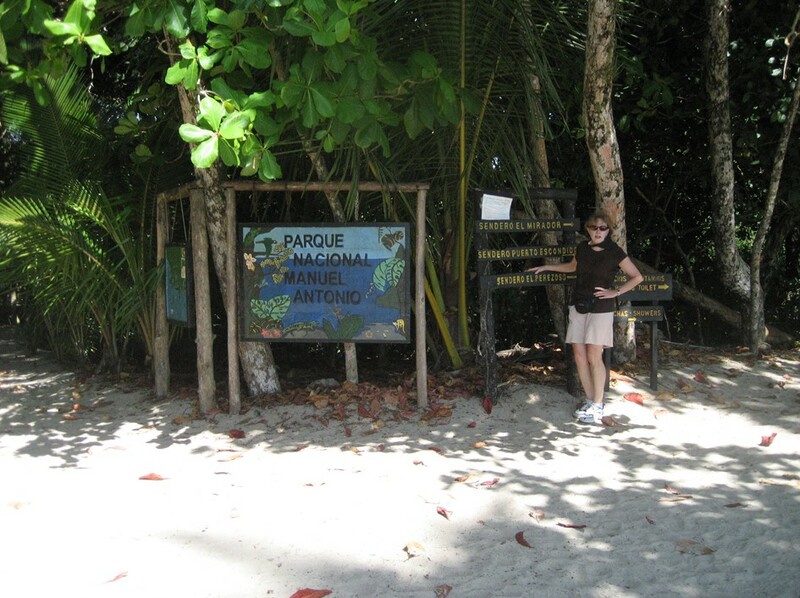 We were dropped off at the beach and had to walk about ¼ mile to the park entrance, fording a small river along the way. 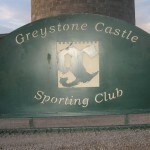 We paid our entrance fee and declined the offer of joining a group for a guided tour. A large map displayed the various route options and we decided to press out on our own. 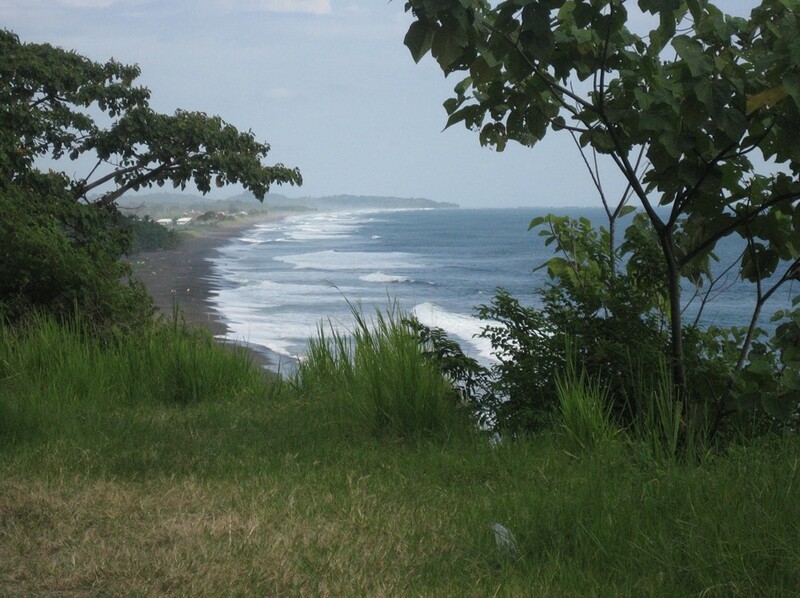 The well-worn route started at a beautiful beach. 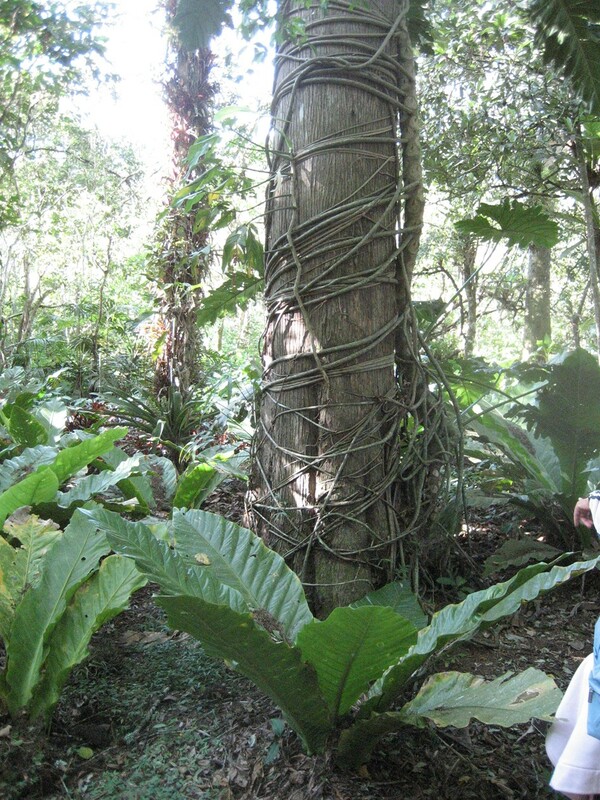 It proceeded through a tangle of vines some of which had been tied back to facilitate passage. We should have known that the map would not be to scale and that the paths would not be well marked. 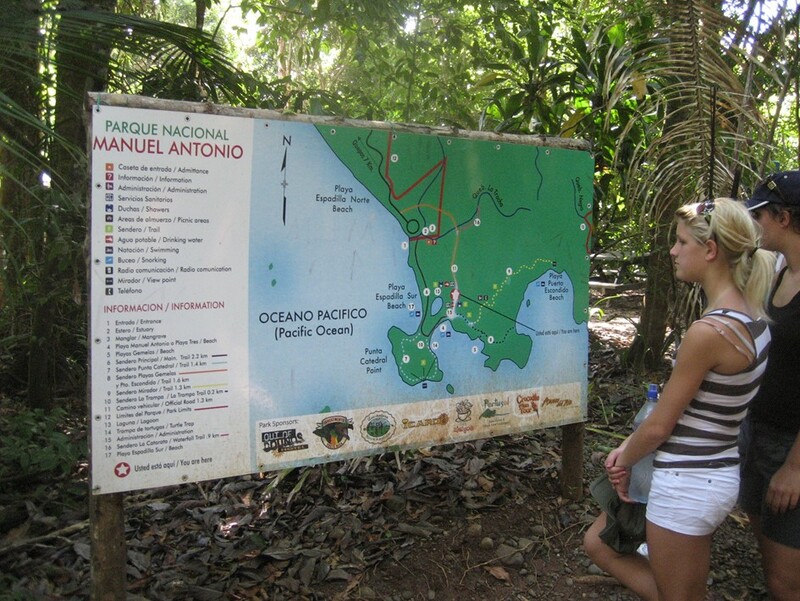 We ended up wandering off the main trail and onto an incredibly narrow path that snaked up and down steep hills through the jungle. We were not disappointed with our decision, however. 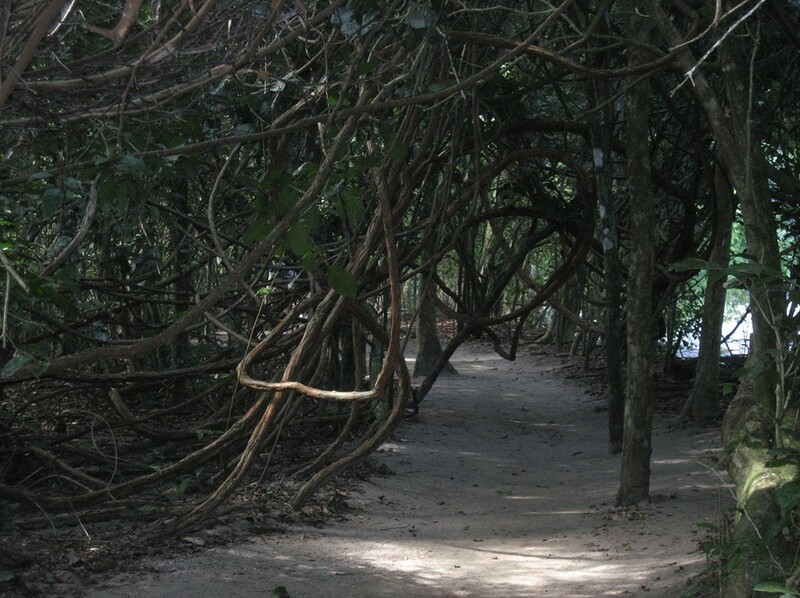 The path took us into what can best be described as a monkey village. We found ourselves in the midst of about 15 white-faced monkeys eating leaves, swinging among the branches and playing games with each other. 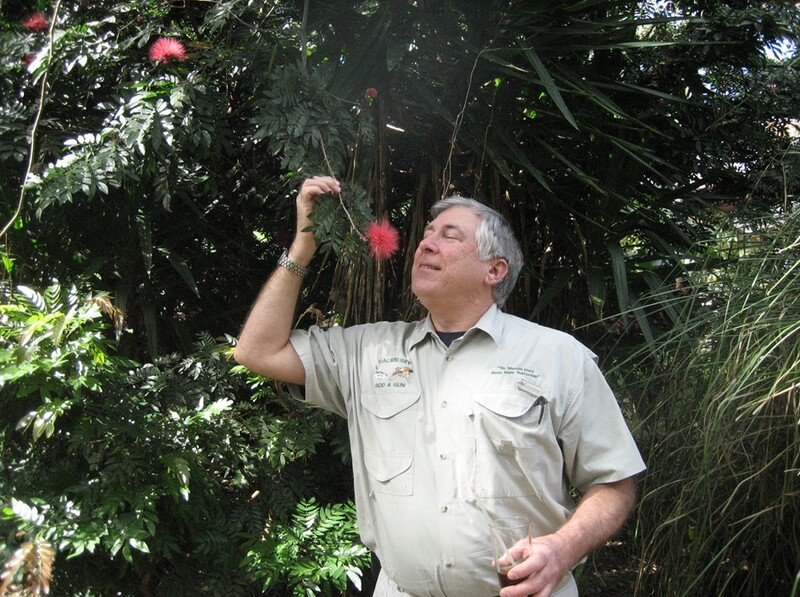 At one point a monkey trying to reach a branch jumped over my head missing me by only 2 feet. We also observed a three-toed sloth high in a tree. It was amazing how it moved in such graceful yet slow motion. 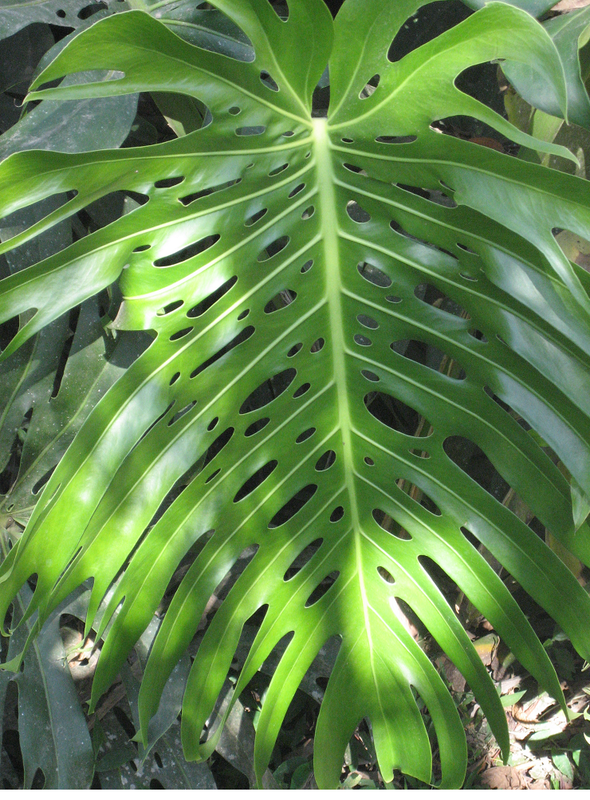 We also saw a small vine snake, many lizards, and some butterflies. 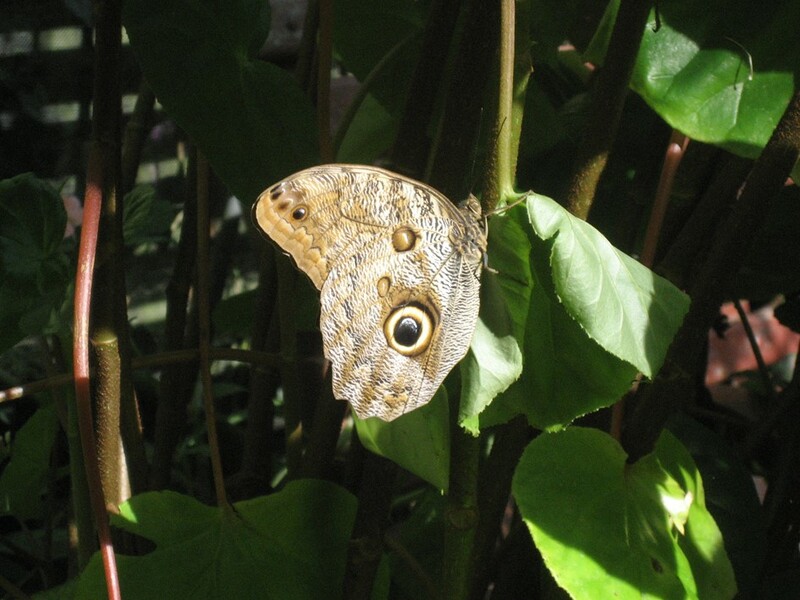 One butterfly in particular was very large and blue on one side of its wings. 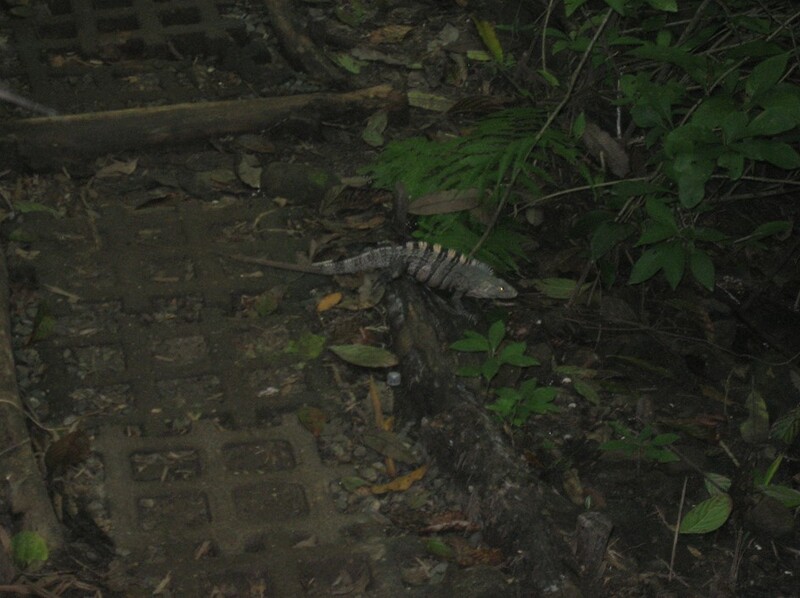 We also had what we thought was an iguana cross our path. A fellow traveler stopped along the path and informed us that it was not an iguana but rather a Centurion Lizard. We followed our rather obscure path until it met the main path and then found our way back to the starting point. We were soaking wet with sweat not only from the strenuous climbing but also from the humid jungle climate. At the park entrance we found a small restaurant and settled down for a salad and a Coke Lite. 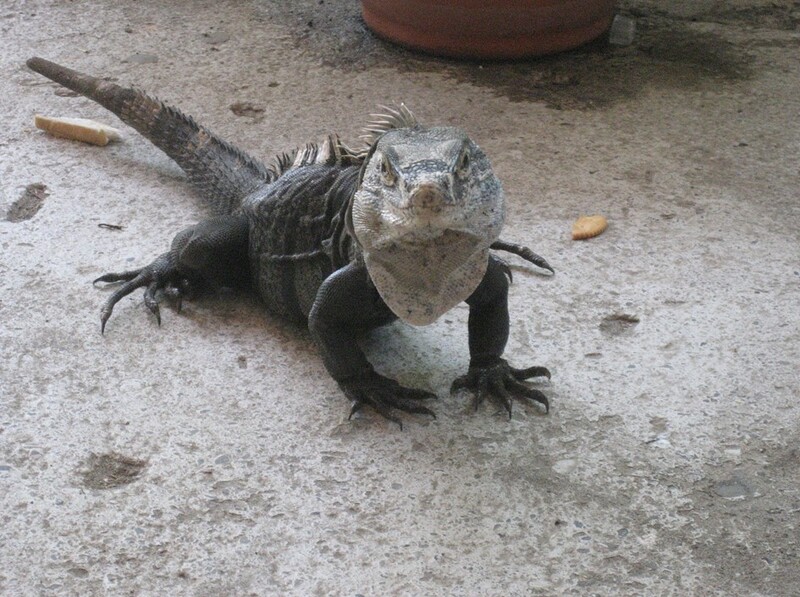 Soon a large hungry Iguana joined us. Fortunately, he chose another table to look for food. 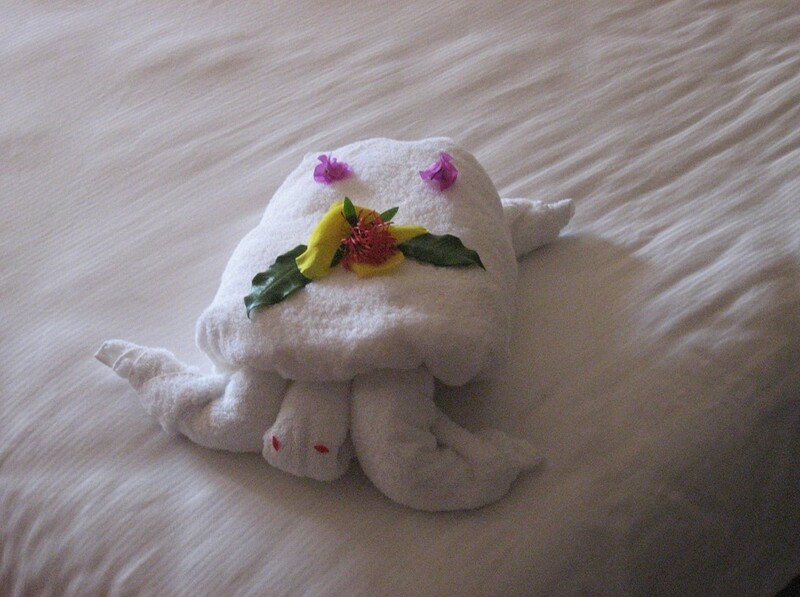 When we returned to our room we found that the maid had left us a turtle created from towels and washcloths. Following happy hour at the hotel, we drove a short distance to a pizza restaurant and enjoyed a good dinner. Thursday was chosen as the day for dolphin watching. 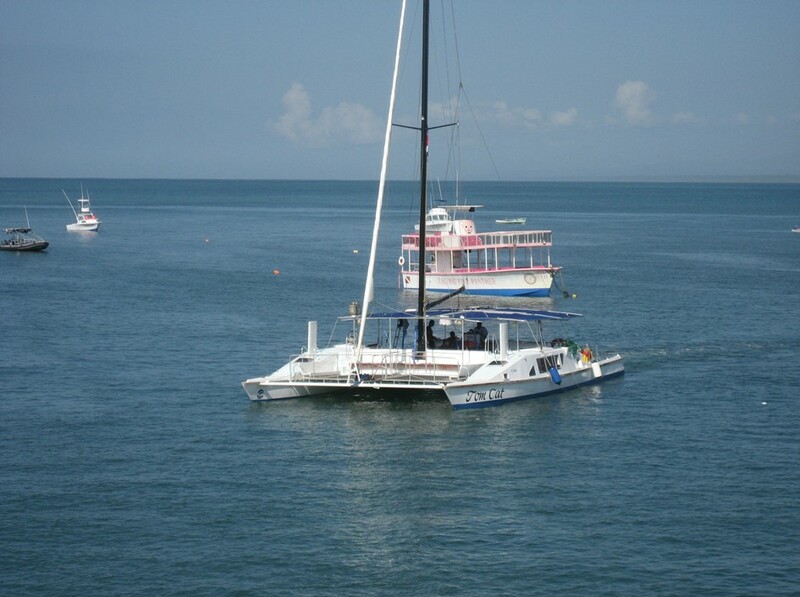 We boarded the ‘Top Cat’ catamaran and powered out near the Manuel Antonio National Park to look for dolphins or whales. The crew told us that we could see one or the other or both. We saw dolphins. We caught up with a school of about six and followed them for about ½ hour. Along the way we passed very close to the peninsula on which our hotel sat. We got a good view of the hotel from the waterside. 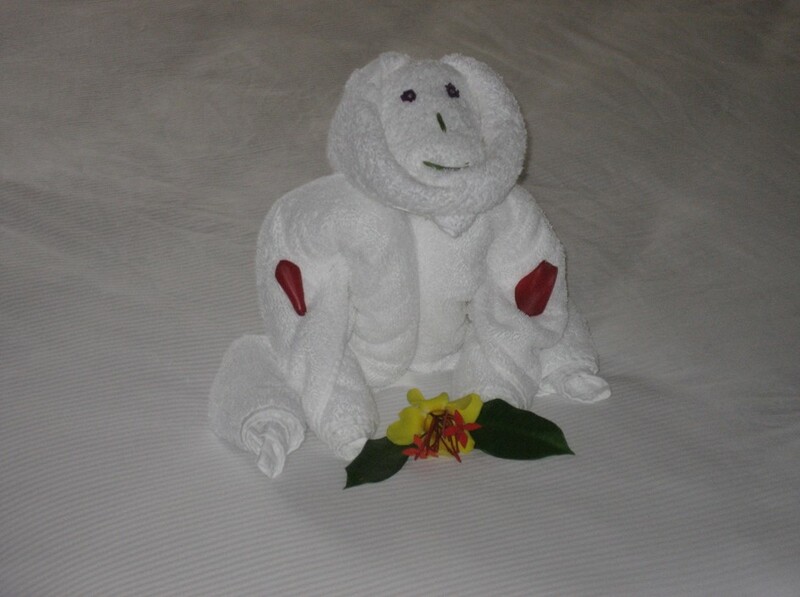 Upon returning to our room from this trip, we found a towel monkey. Dinner this night was at a highly-touted restaurant that proved to be somewhat disappointing. We still enjoyed the scenery and the wait staff was friendly and helpful. 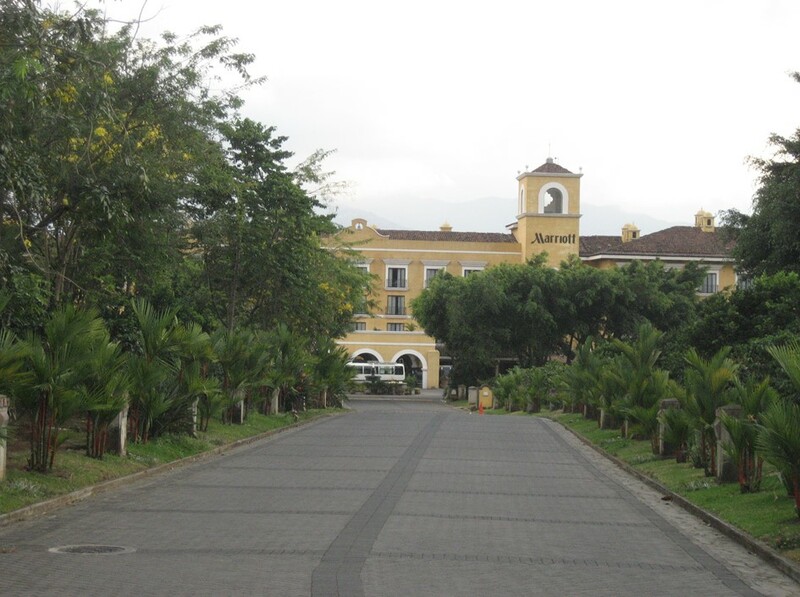 Friday was our last day in Quepos. Saturday we plan to drive back to San Jose, return our rental car and relax at the Hotel Aeropuerto before flying back to Chicago on Sunday. 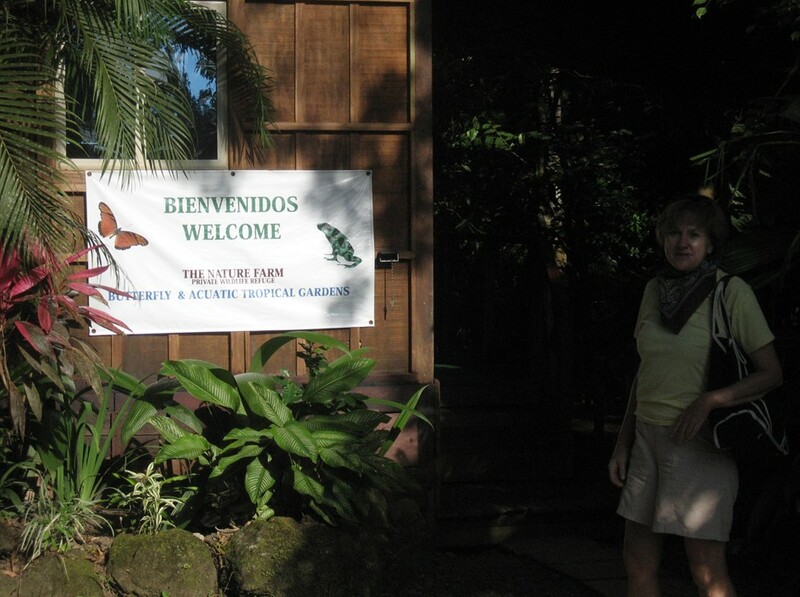 We left our hotel at 8:45 am in time to drive to the Nature Farm and make the scheduled 9:00 am tour. Unfortunately, we got held up not 100 yards from the hotel. 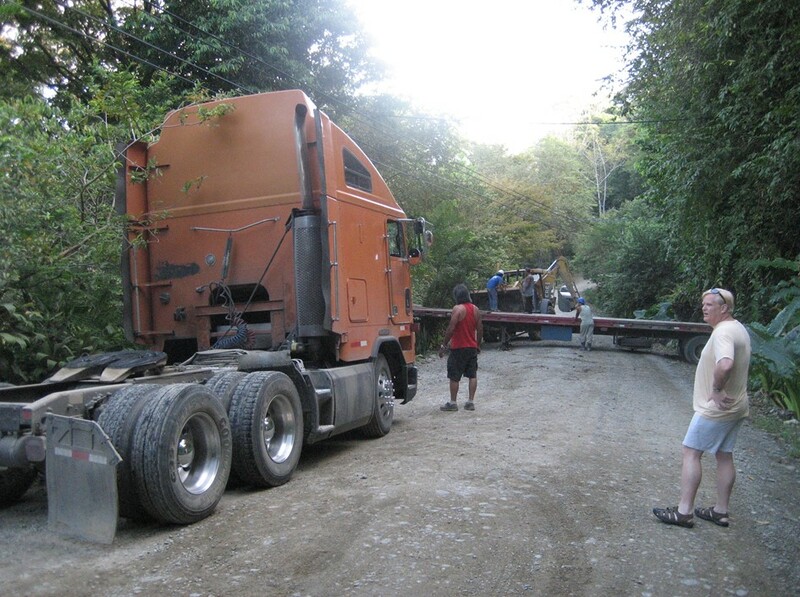 As an indication of just how narrow and steep the roads are, we encountered an 18-wheel tractor with a flat bed trailer. He was picking up construction materials from a job site a short distance up the road. He had driven down our road only to find that there was absolutely nowhere for him to turn around. The only solution was for him to drive in one way and then use a high-lift tractor to lift the flat bed off of the tractor and drag it 180 degrees so the trucker could reconnect his trailer going the other direction. It was quite an operation to watch. I took about ½ hour to get the trailer turned around enough for us to pass. 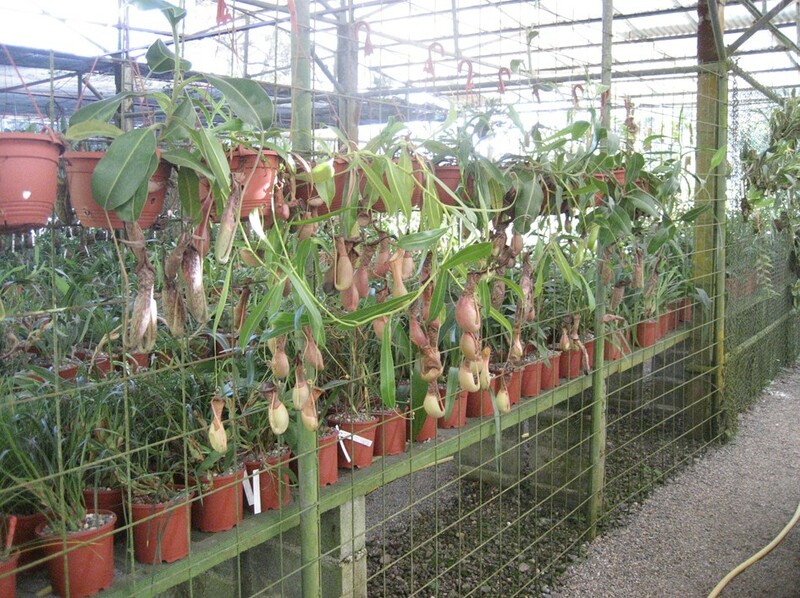 We got to the Nature Farm at 9:15 am but they were very accommodating and assigned us a very informative guide. 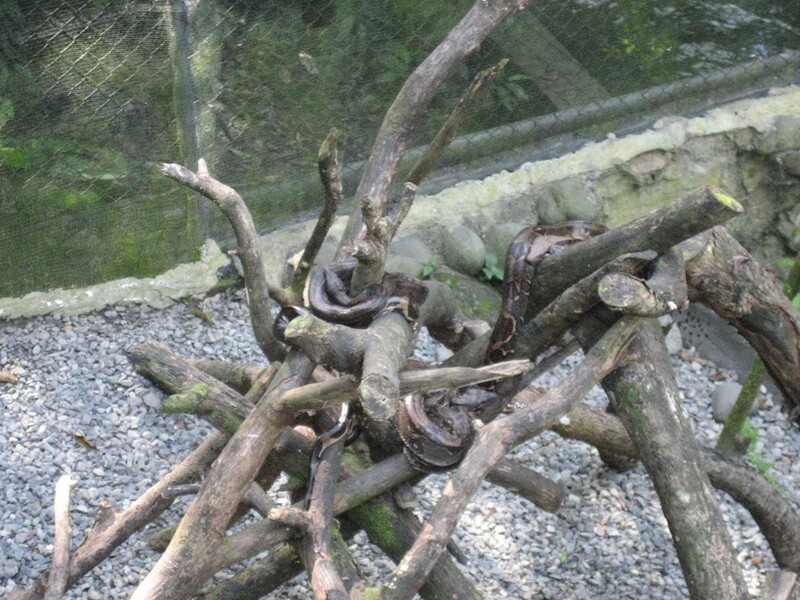 There are two parts to the Nature Farm, the butterflies and a reptile enclosure. 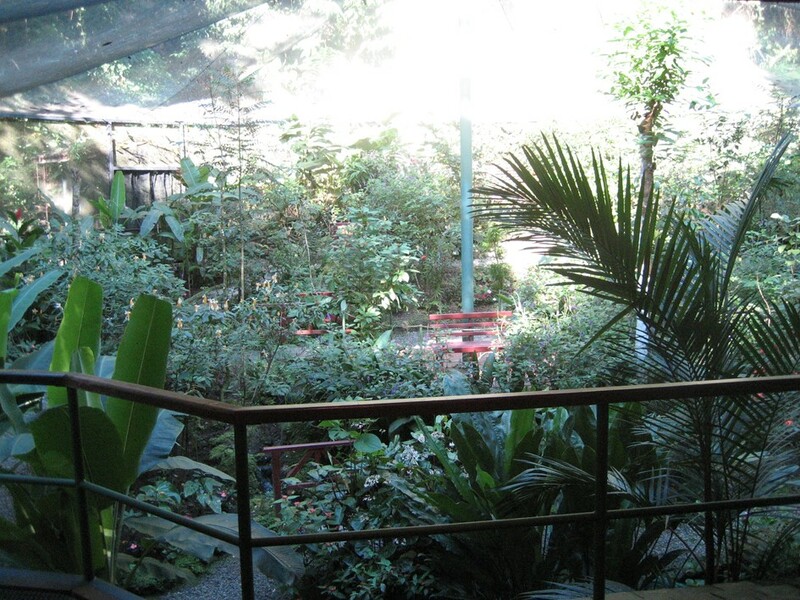 We began with the butterfly enclosure, which is the entrance to the right. 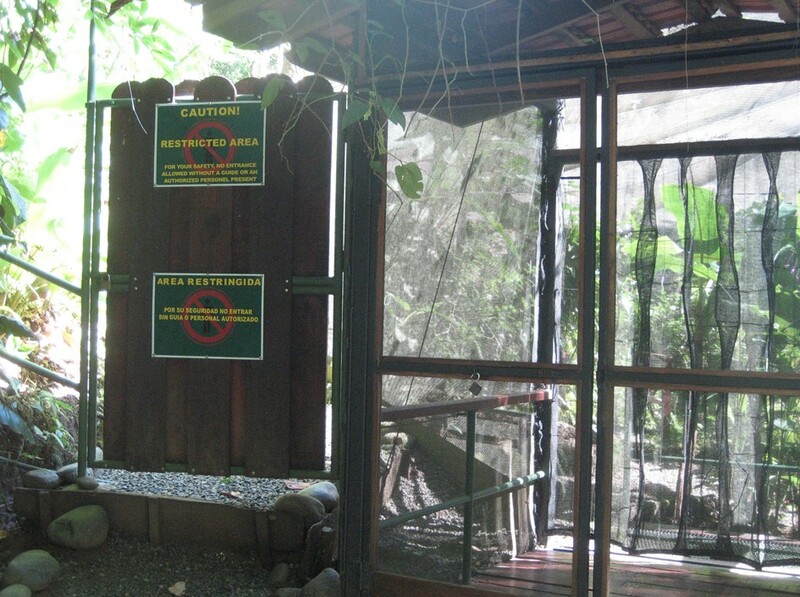 On the left, you can see the locked entrance to the reptile enclosure. 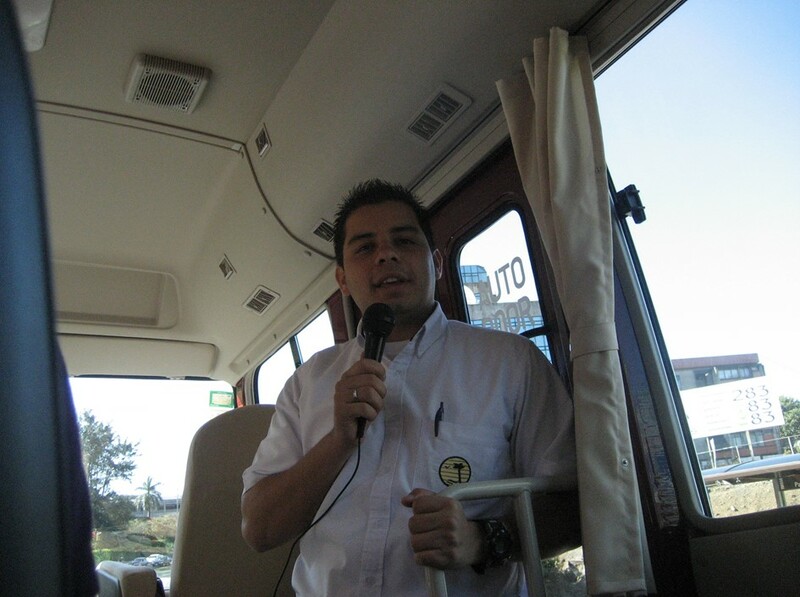 Our guide was very helpful and informative. 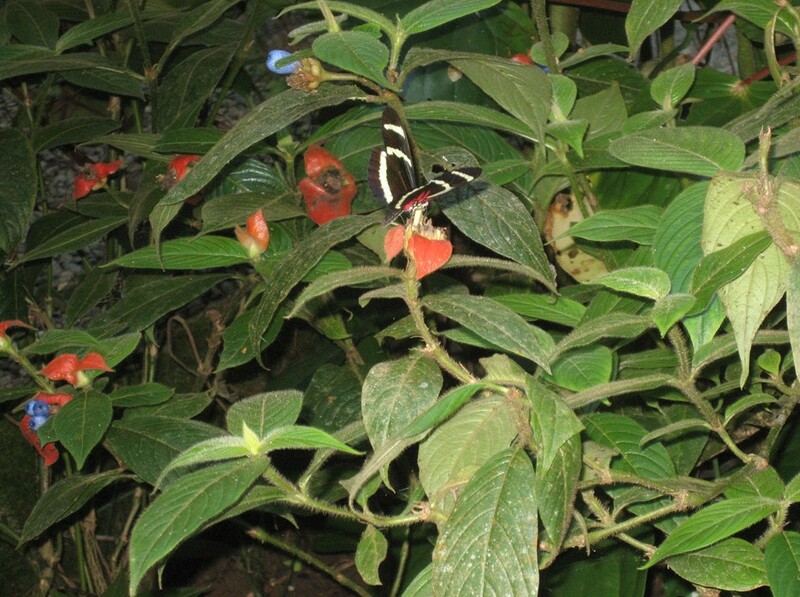 There were boxes that held live butterflies in the various stages of development. 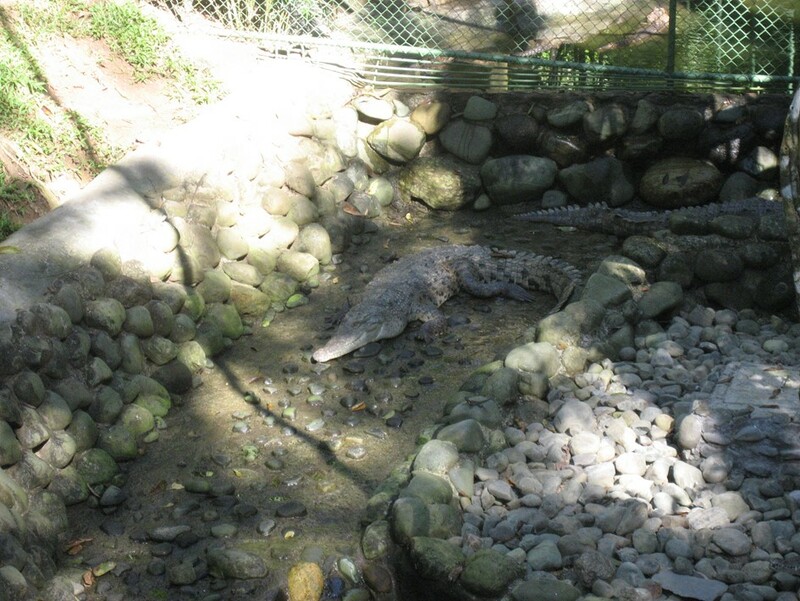 Our guide then took us through locked gates into the reptile enclosure. 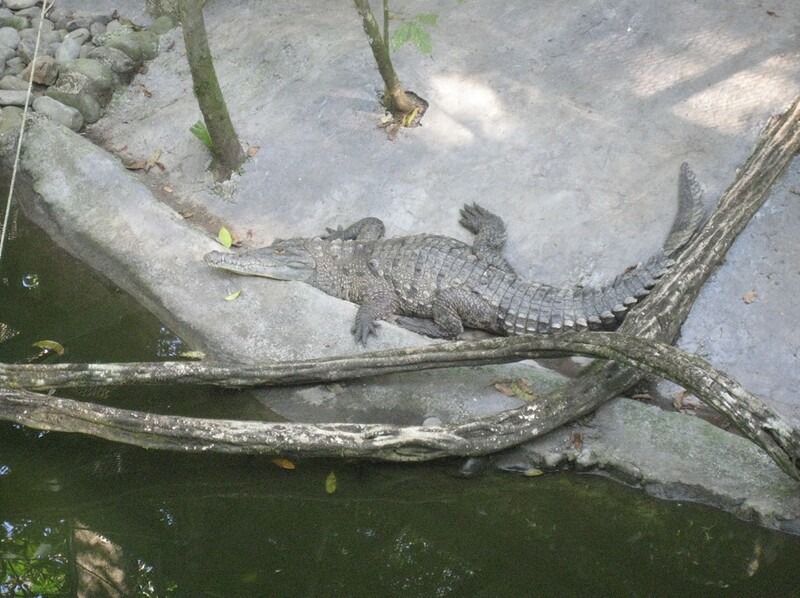 The place was loaded with crocodiles, boa constrictors, snapping turtles and other lovely creatures. 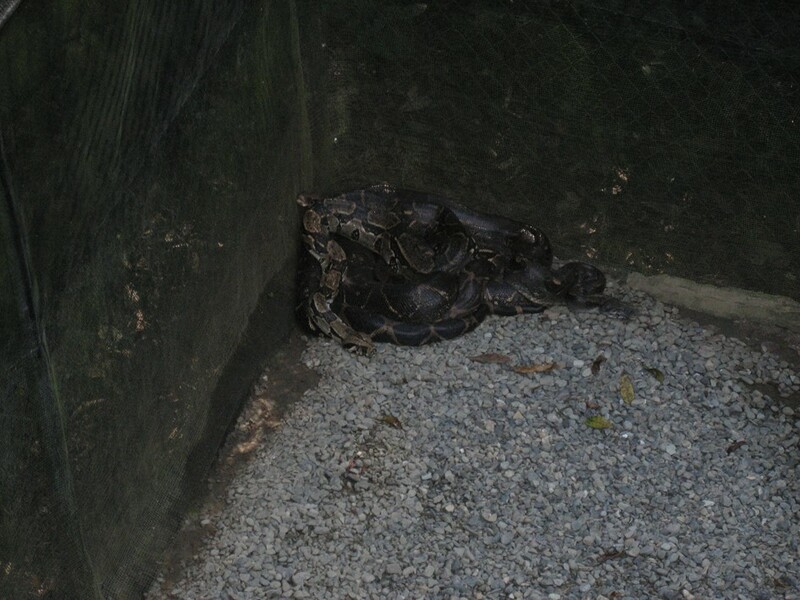 The boa constrictors were mostly huddled in the corner. 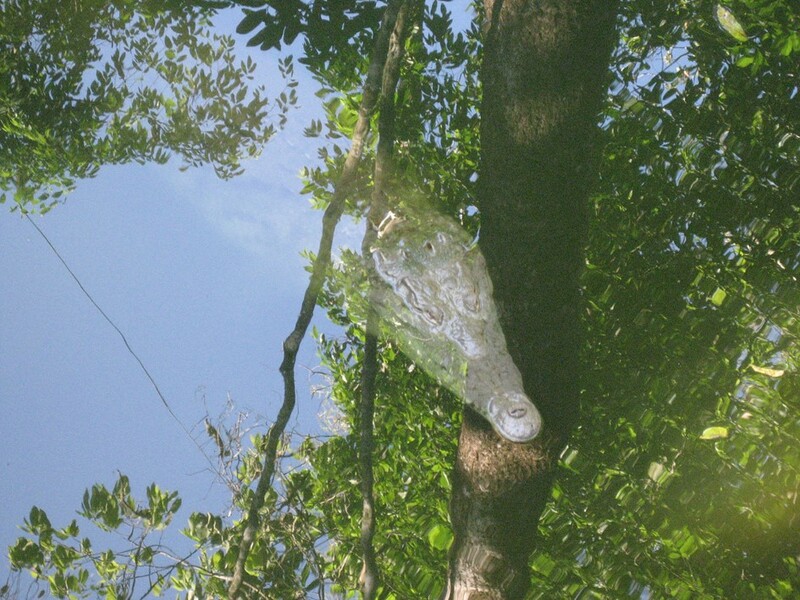 The head crocodile was submerged a few inches under the water persuading the other crocodiles to remain out on the banks. With a few claps and whistles our guide coaxed the old boy to the surface looking for food. He was truly huge. 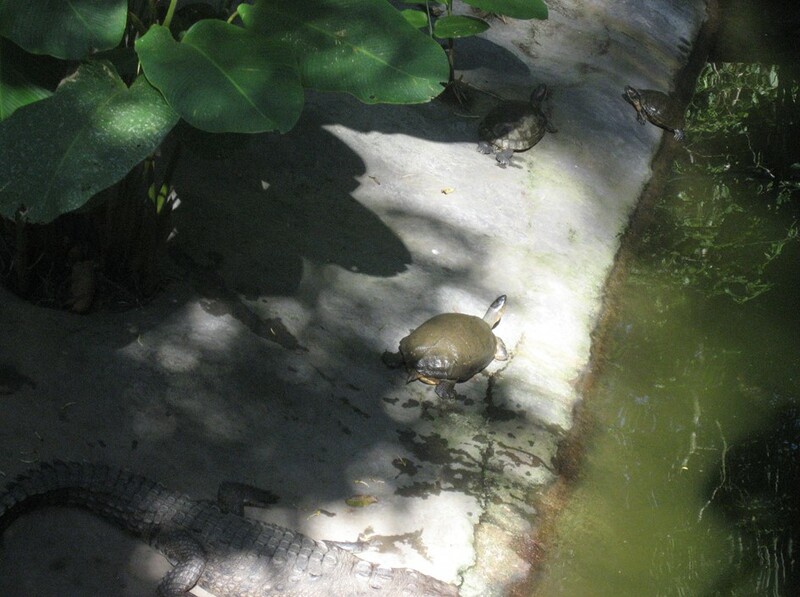 The turtles were also moving about with little concern for the crocodiles. The tour itself took about 1 hour and then our guide left us back in the butterfly enclosure to relax and enjoy the sights. Friday was a very hot day with little breeze. We spent most of the day poolside at the hotel relaxing and reading. 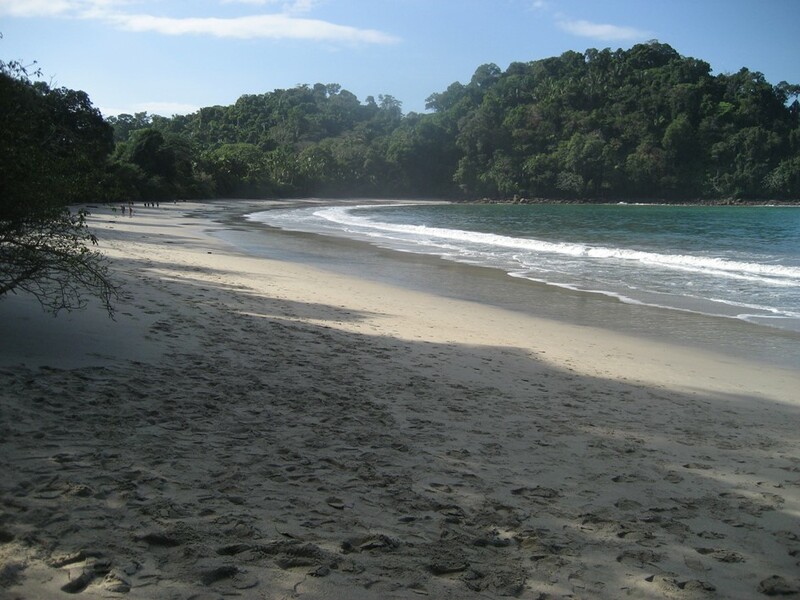 Later in the afternoon we drove back to the beach at the Manuel Antonio National Park for a long beach walk. The hotel had a very special dinner Friday night with grilled lobster. We enjoyed a wonderful dinner on our last night in Quepos. Saturday morning we enjoyed breakfast and three hours at the pool before packing, loading our luggage in the car and driving back to San Jose. The drive to San Jose took about 3 ½ hours. We were delayed about ½ hour at one of the one lane bridges but the rest of the delay was just traffic. 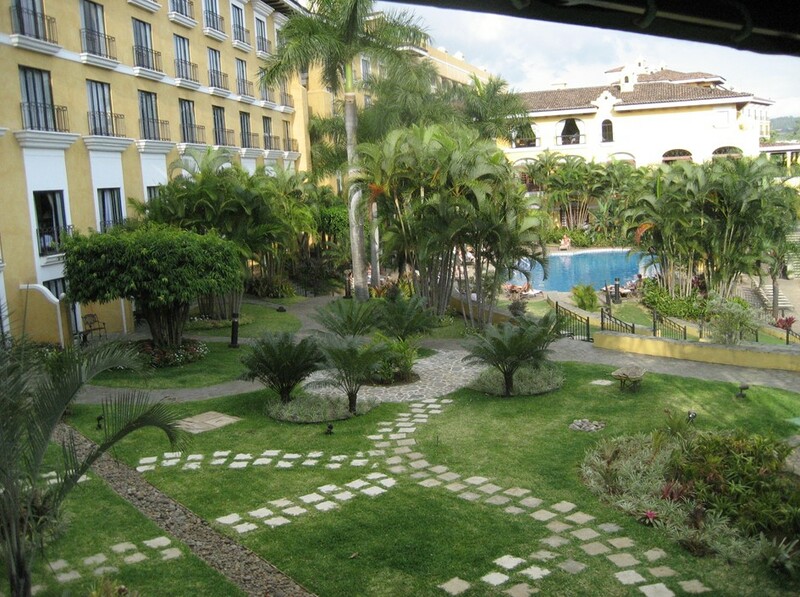 We checked into the Hotel Aeropuerto in San Jose and then returned our rental car. A quiet dinner in the hotel completed our vacation in Costa Rica.